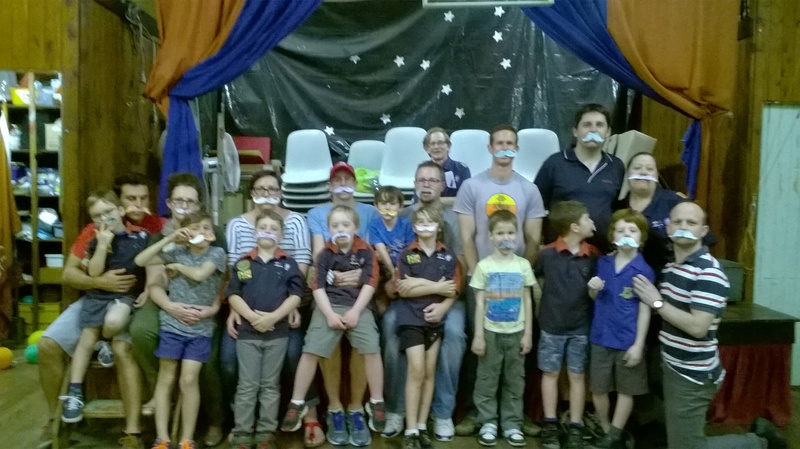 Father’s Day was celebrated in true Joey mob style with all of the dads (or carers) invited along to the mob meeting. 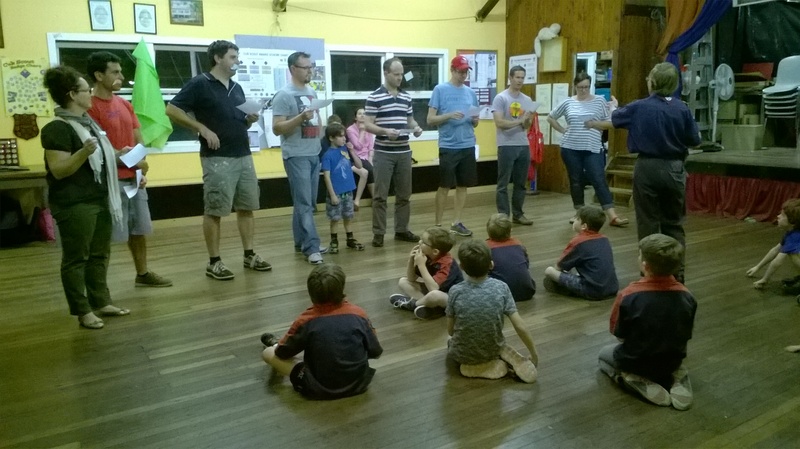 The dad’s were sworn in as ‘Honourary Joeys’ for the evening and then had to prove that they knew what Joeys was all about by solving the answers to the rigorous quiz from our resident Scouting expert – Wolf. 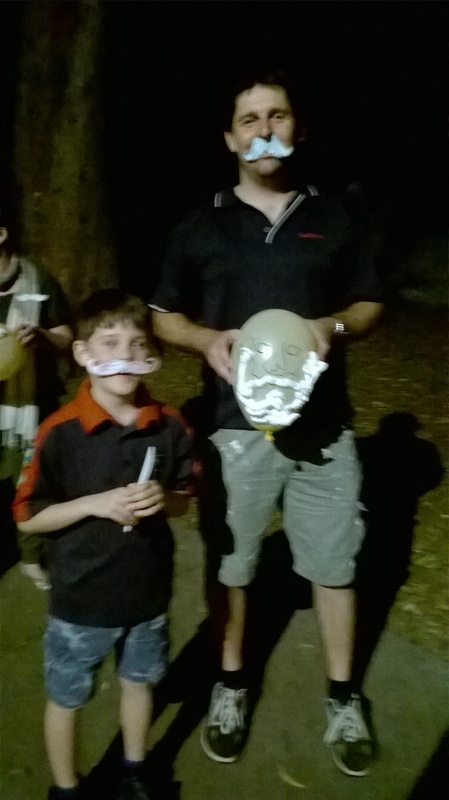 To really get in the spirit of Father’s night, the whole mob made moustaches to wear and here is the evidence… Then it was onto some games before heading outside to ‘Shave Dad’. 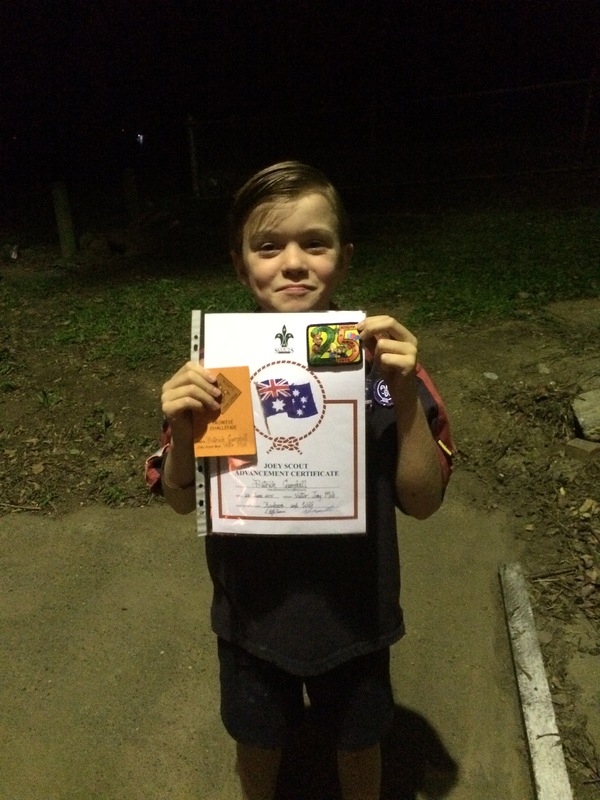 The night ended with the Joeys sharing supper with their parents and giving Dad the Fathers Day gifts they had made for them – a Best Dad certificate and a hand stamped leather key ring. A great night was had by all. 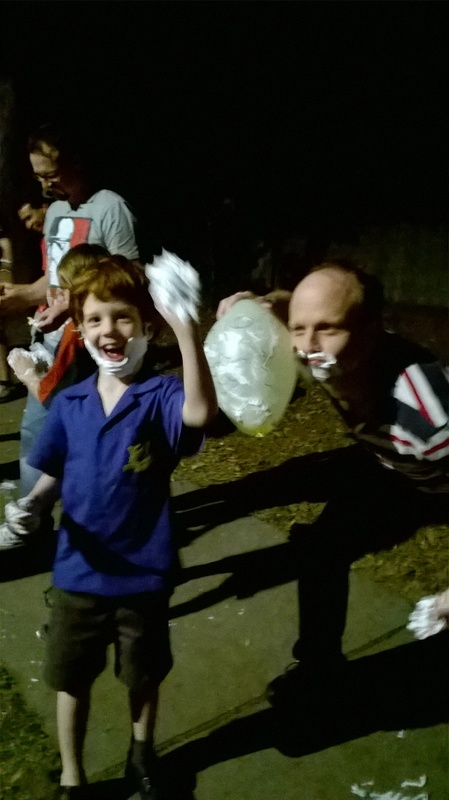 Thank you to the Dads and carers for being such good sports. All the fun of the country fair at Skillorama. 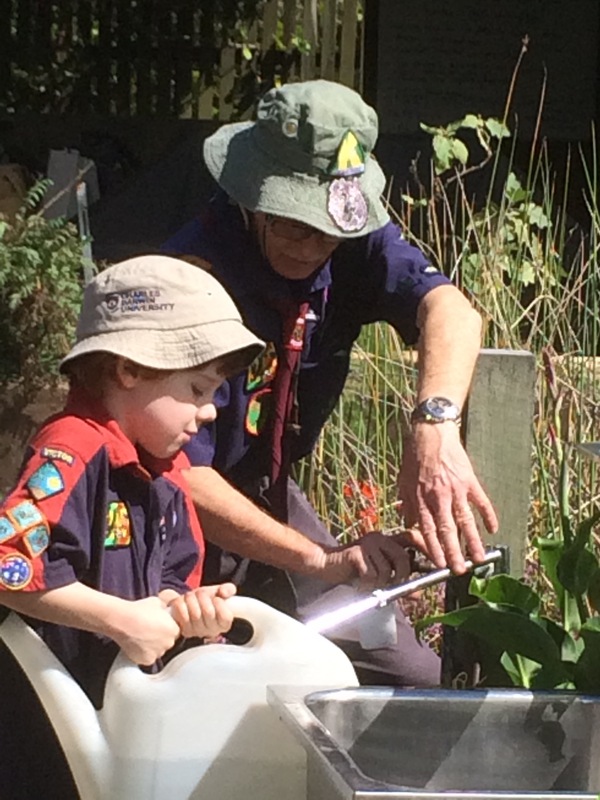 The sun was shining, 1300 cubs and joeys were buzzing around and the stage was set for another fantastic Skillorama. 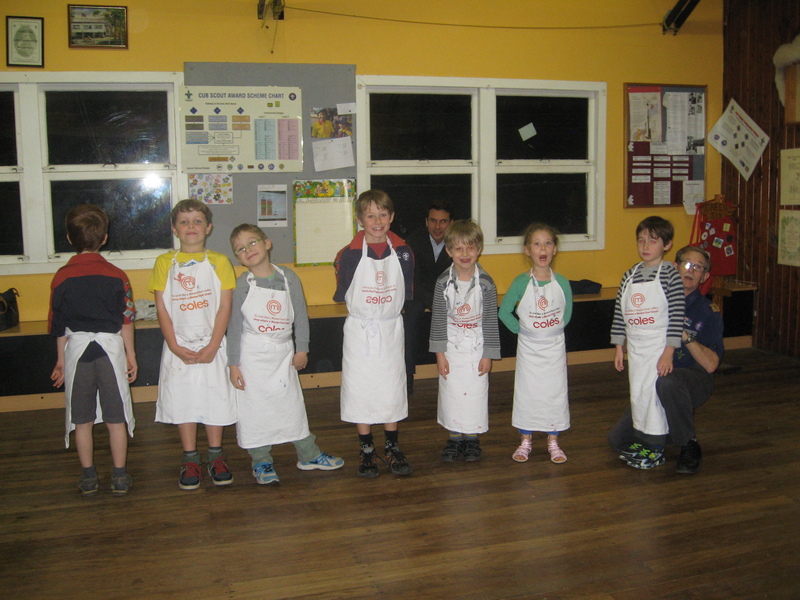 Victor Joeys, and some cub siblings, were ready for another adventure based on this years theme – ‘ Country and Farm’. egg and spoon, milking the cows were just a few. 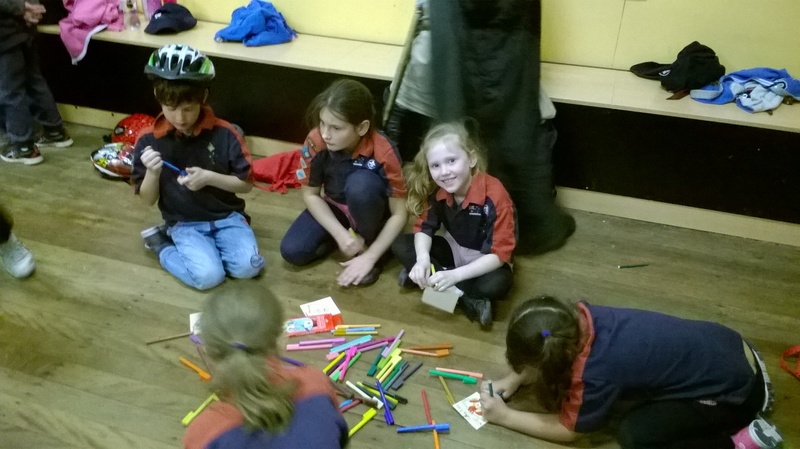 Between the activity bases, the joeys also managed to squeeze in visits to the woggle makers, air activity and environment teams stations, badge club, gem stone club and lunch. Phew! So much to do and so little time. All the youth members went home exhausted but thrilled to have a badge and show bag to show everyone what a brilliant day they had. And I’ve heard that they all slept in the next day as an extra bonus for Dad on Fathers Day. 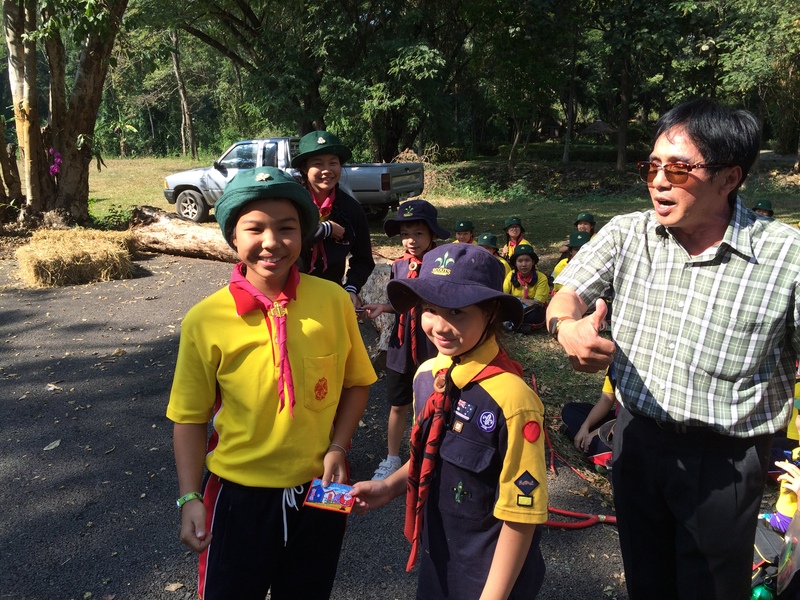 Scouts In Action Month and an international badge earned! 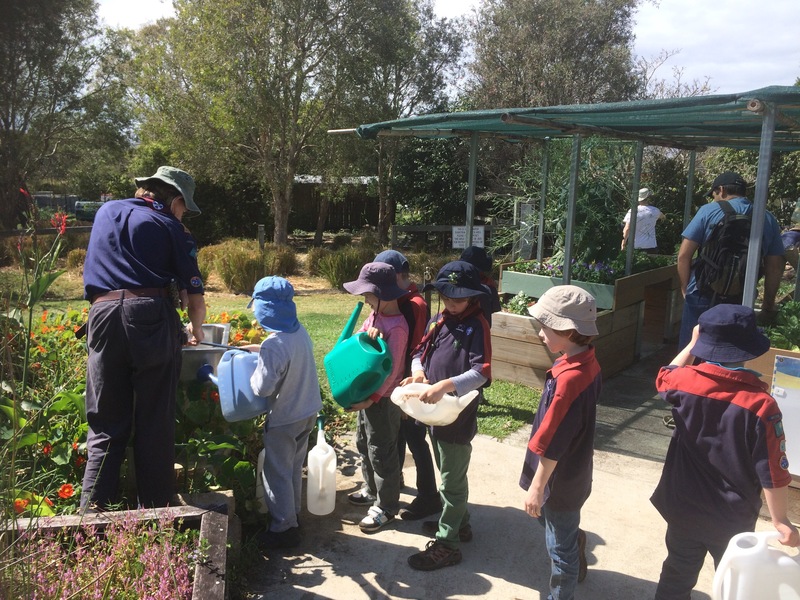 All of the Joeys worked very hard this term, and especially during August (which is Scouts in Action Month). 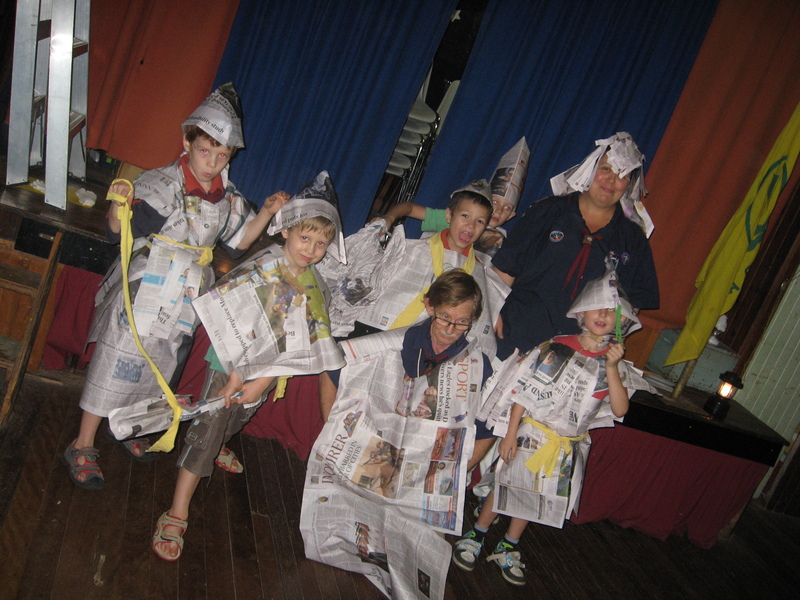 The mob spent 4 weeks focusing on the environment and exploring a different theme each week with Bagheera, Wolf and Rikki. 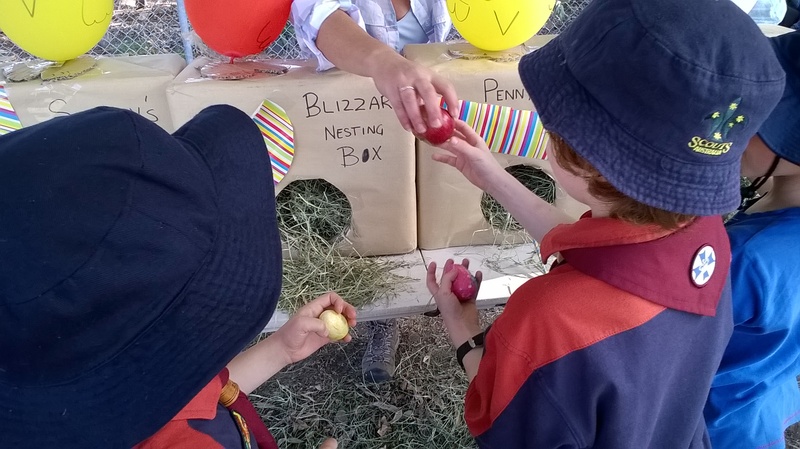 The theme for the month – ‘Scouts in the Environment’ – allowed the Joeys the opportunity to discover the world around them whilst having a lot of fun. 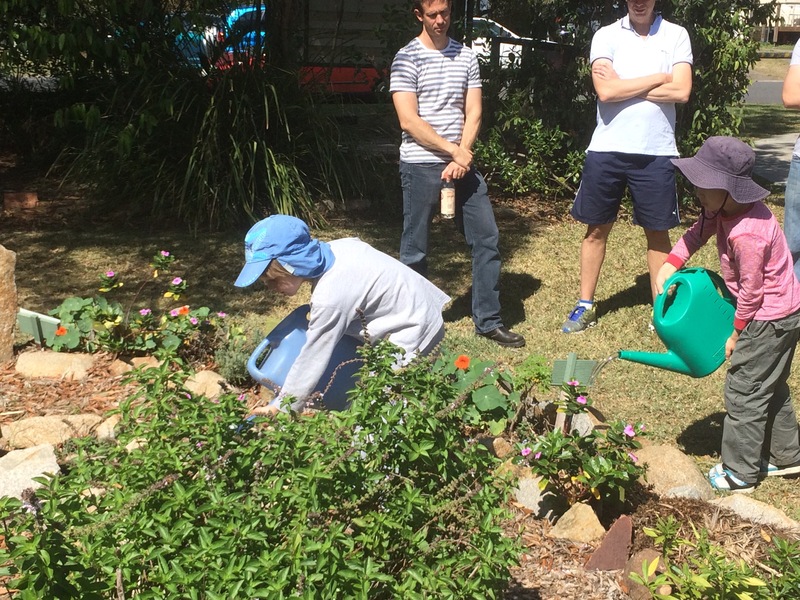 Recycling; Clean water, clean Air; Animals and their habitat; People in the environment (who works in it and why); the habitat in their own backyards and gardening and preservation/conservation all gave the Joeys the chance to learn new things and to really think about humans and the environment. 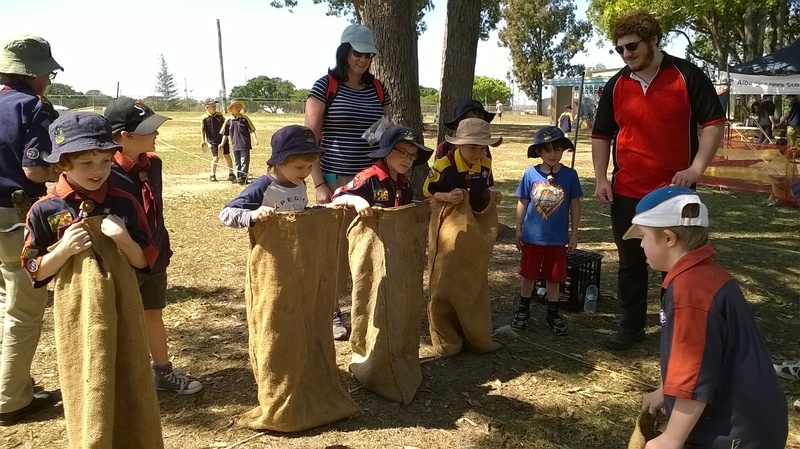 As Junior Joey rangers, they explored the environment around the den, the local neighbourhood, at BP Park and finally at Beelarong Community Farm – finding out what trees grow in their location, what kinds of animals live there and how they could help ( not littering, planting trees and attracting native animals to their gardens). 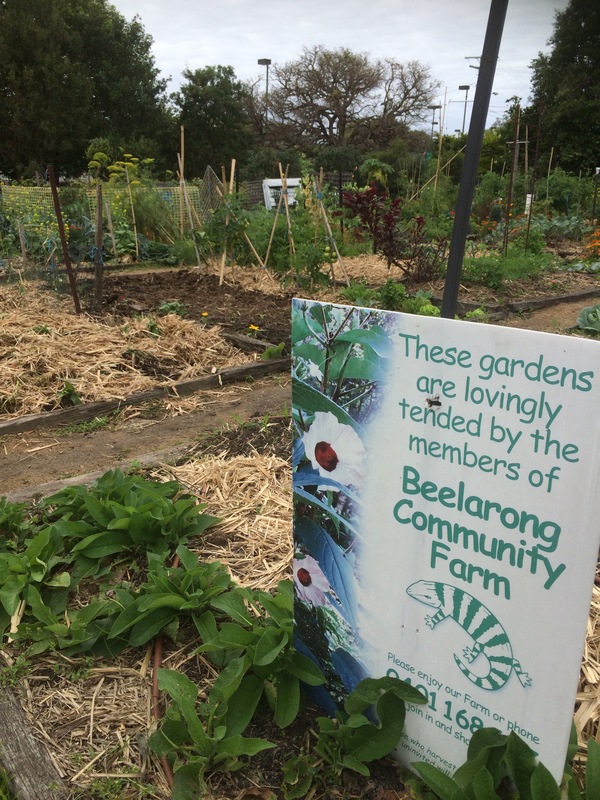 The Joeys also made native bee hives from recycled tins and donated one to Beelarong as thank you gift. 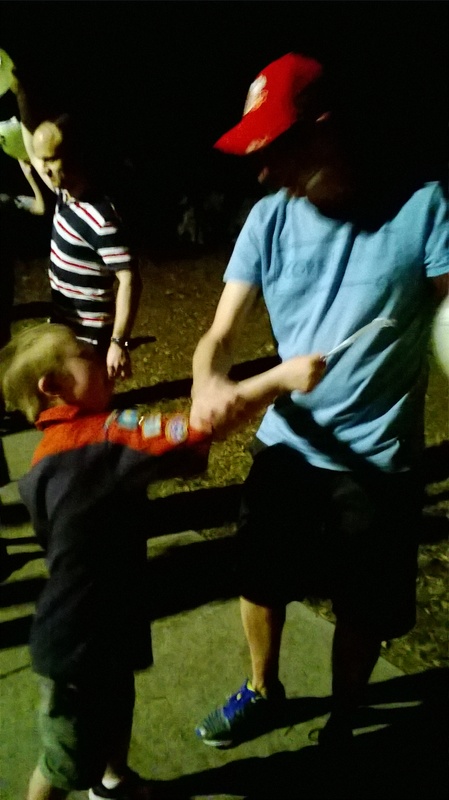 They each earned the following badges – Joey Environment Challenge badge and the Scouts in Action Month badge. 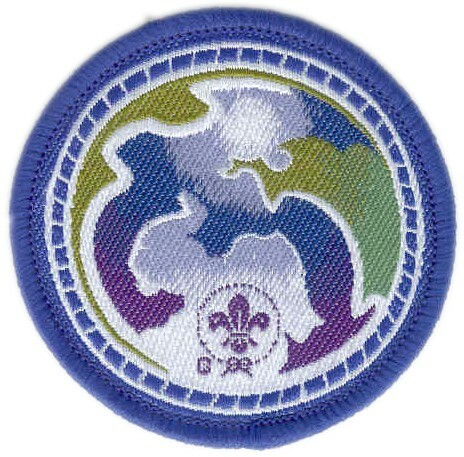 They also each achieved an international Scout badge that requires a lot of extra work and participation in a community activity: the World Scout Environment Badge. 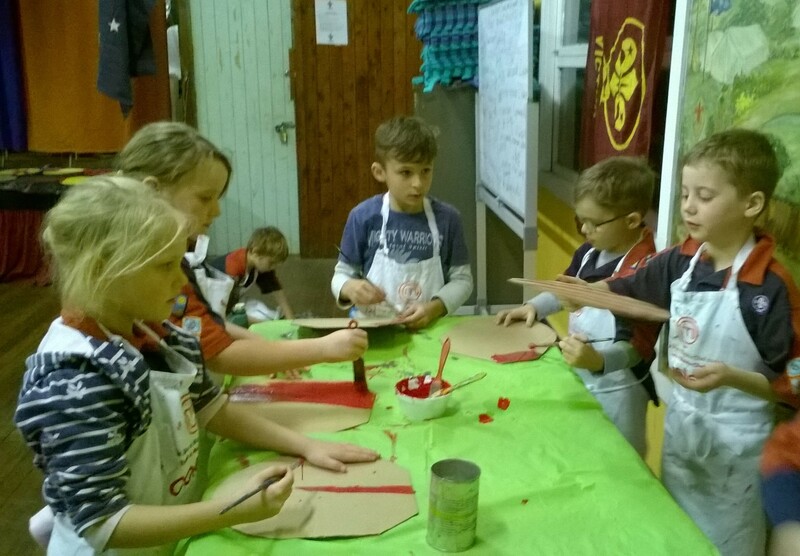 The final part of the badge is taking part in a local community activity. 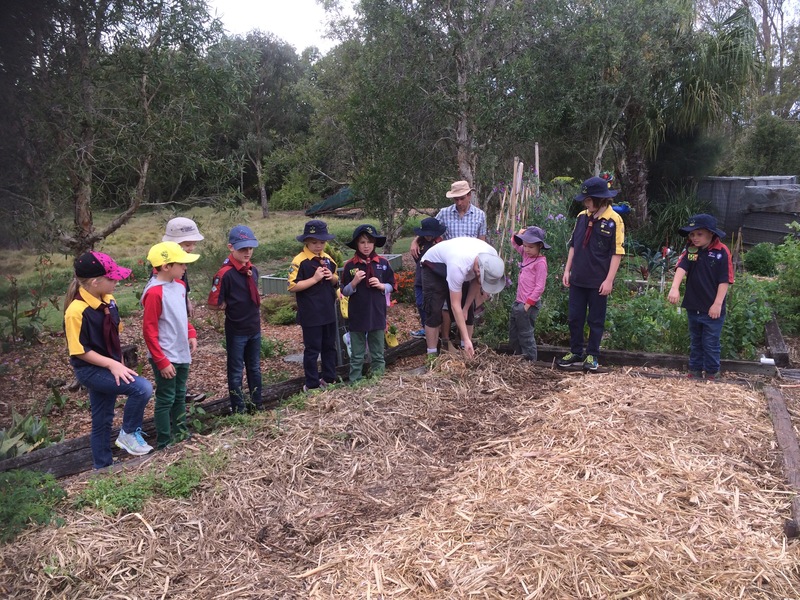 The Joeys visited Beelarong Community Farm for this final task. B-R-A-V-O Joeys for all your hard work and a thank you to our families for their support with this badge work. Victor Joeys Scouts of the Round Table! Hear ye, Hear ye! 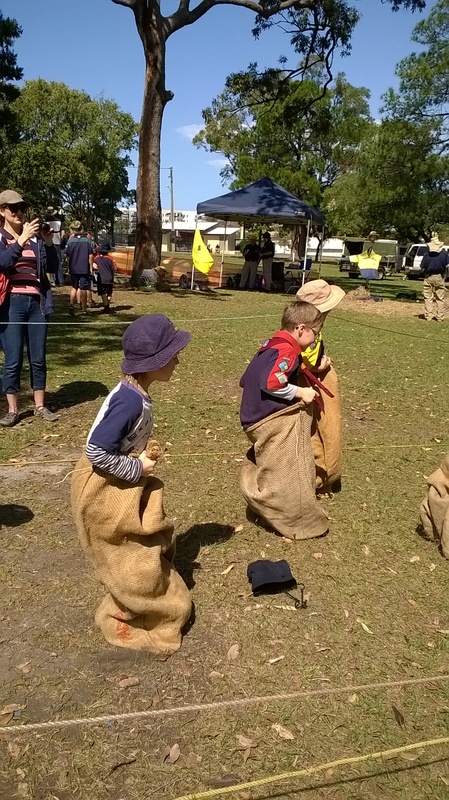 On the First day of the month of August, 800 Joeys and leaders advanced upon the site of BP Park to celebrate 25 Years of Joeys Scouts in Australia. 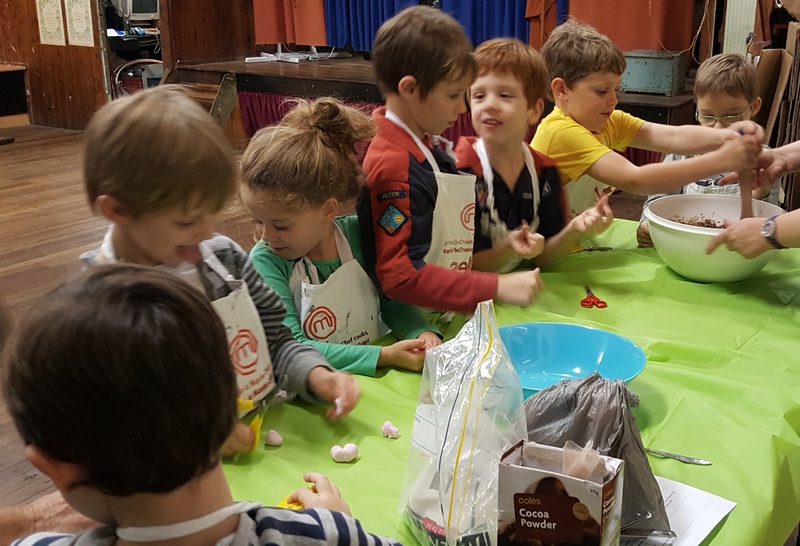 Jousting, Knight training, battlement scaling (aka rock wall climbing), treasure hunting and shield making culminated in a campfire and cake. And some very tired, but very happy, Joeys. 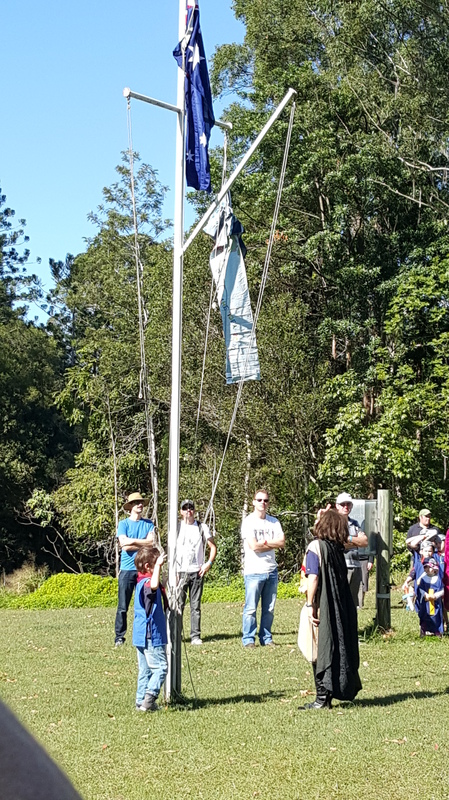 The day started with opening parade and Victor were given the honour of breaking the flag (we were asked personally by the Qld Joey Commissioner)! Jack made us proud when he broke the flag. 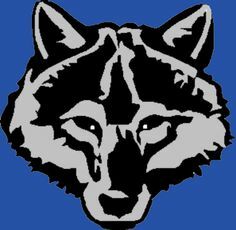 Bravo Jack and Wolf. This year Victor’s activity base was shield making and our parents stepped up and ran it expertly all day. Thank you for doing such a magnificent job. With so many bases to visit and so many interesting things to make or do, the Joeys were spoilt for choice. The mob visited the museum first (and spotted the Victor patch on the museums quilt), the admin tent, first aid station before heading off to the rope bridge. Lunch involved cake to celebrate Wolfs’ birthday and immediately after, we lined up for rock wall climbing. The day ended with a Joey campfire and 25th Anniversary cake. What a fabulous way to celebrate such a exciting year in Joey history! 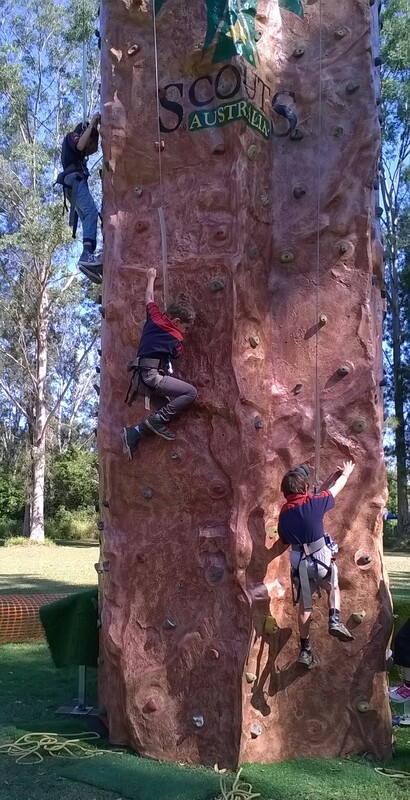 Abseiling, Buddies and medieval fun in term 3! 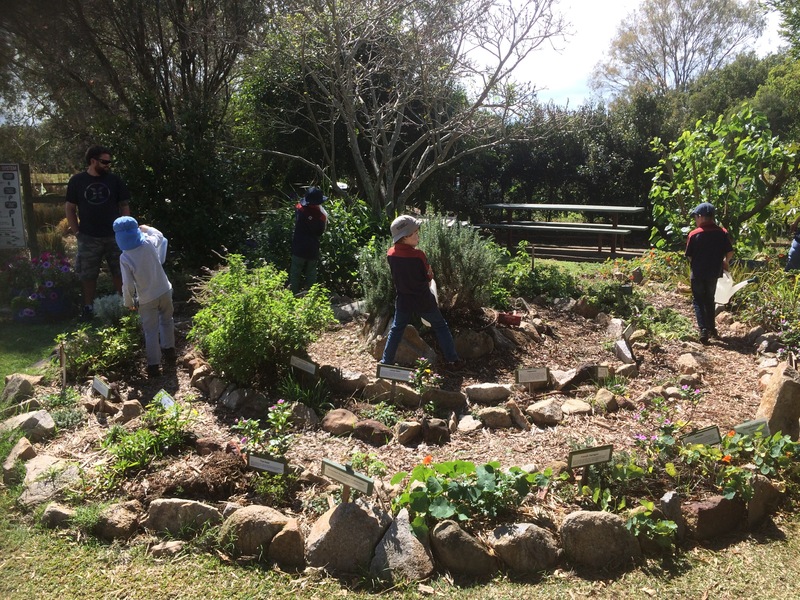 During Term 3 the Joeys focused on the Environment and celebrated Scouts in Action month (August) with a month long celebration of the environment – at home, in their community and also the world. 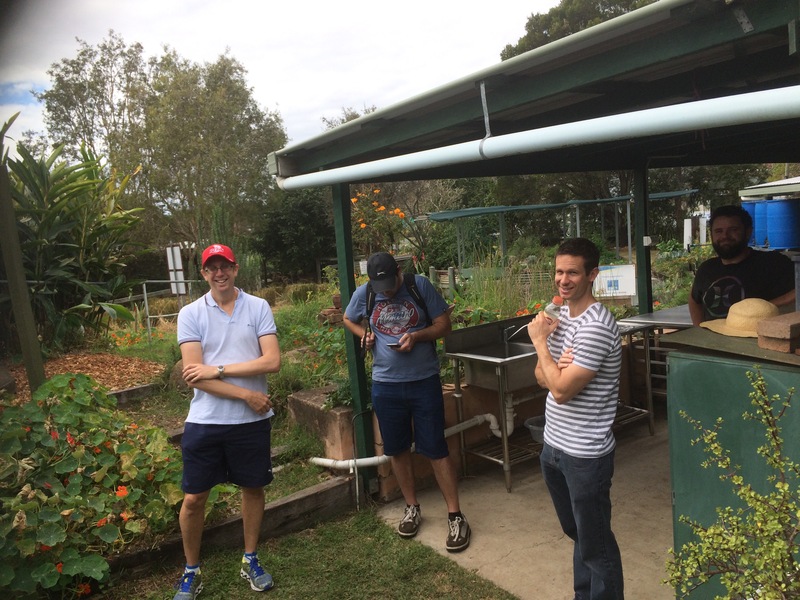 But along the way, they also had some fantastic nights with Clifton Hill and Upper Mt Gravatt mobs, took part in Joey Jaunt and Skillorama, celebrated Fathers Day, checked out the Union Pacific Model trains and spent a morning in a community farm! What is Horizontal abseiling? Read on to find out…. 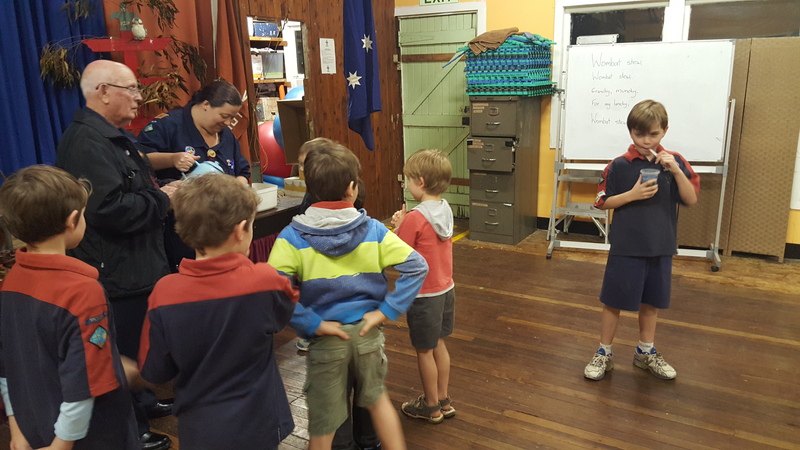 The mob started a new term with a night aimed at building friendship and developing the Joey law – “A Joey Scout Cares, A Joey Scout shares’. 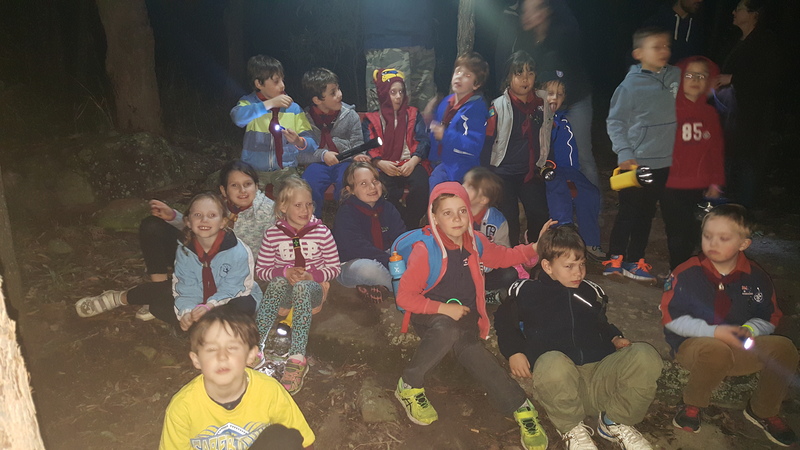 Adventure and fun were the order of the night as the Joeys played games that involved working together and helping each other to complete the challenges. 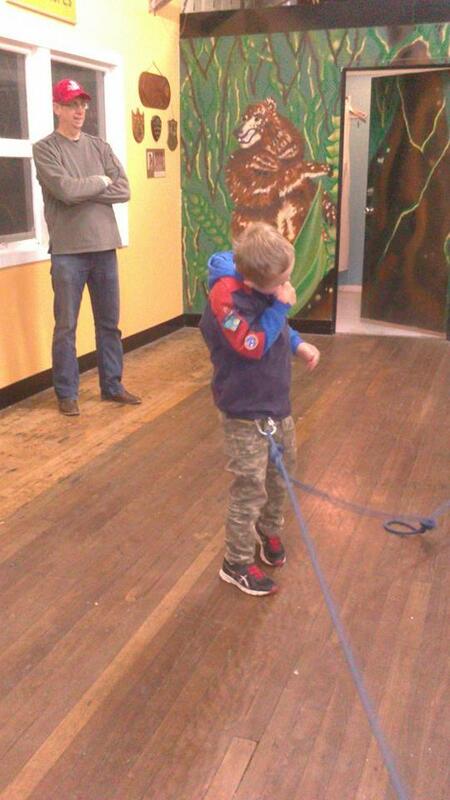 After this, Dan led the Joeys through some abseiling training by ‘explaining the ropes’! 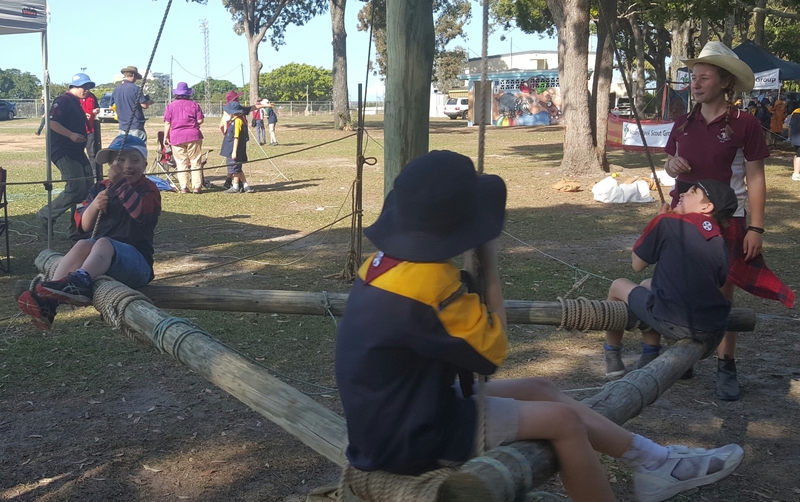 The mob learned about the buddy system, safety with ropes and harnesses, and were shown the knots that are used in abseiling. 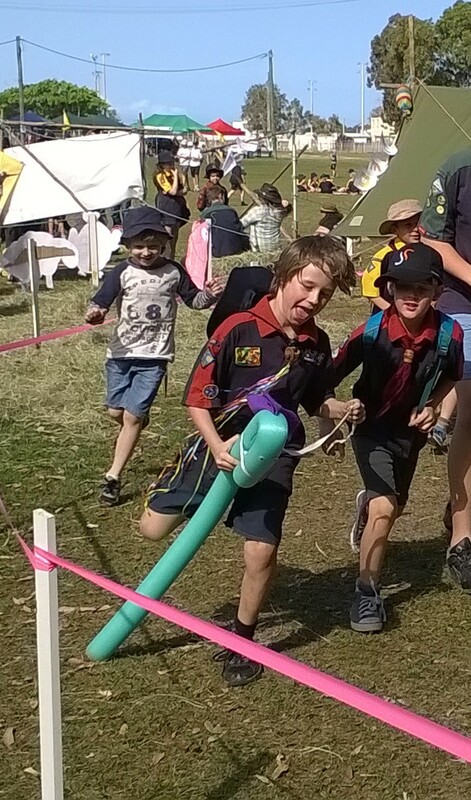 Once all of the mob knew the rules and safety for the activity, Dan and Charlie helped each of the Joeys into a harness and then the ‘horizontal’ fun began. Horizontal abseiling involves using the same techniques that you need for regular vertical abseiling, but travailing across a horizontal surface ( eg hall floor, easement etc). 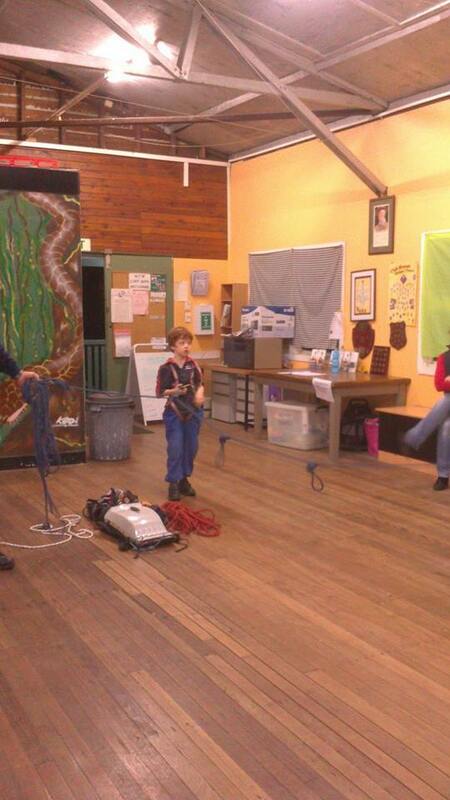 The Joeys absolutely loved the adventure of horizontal abseiling and it was a wonderful start to the new term. 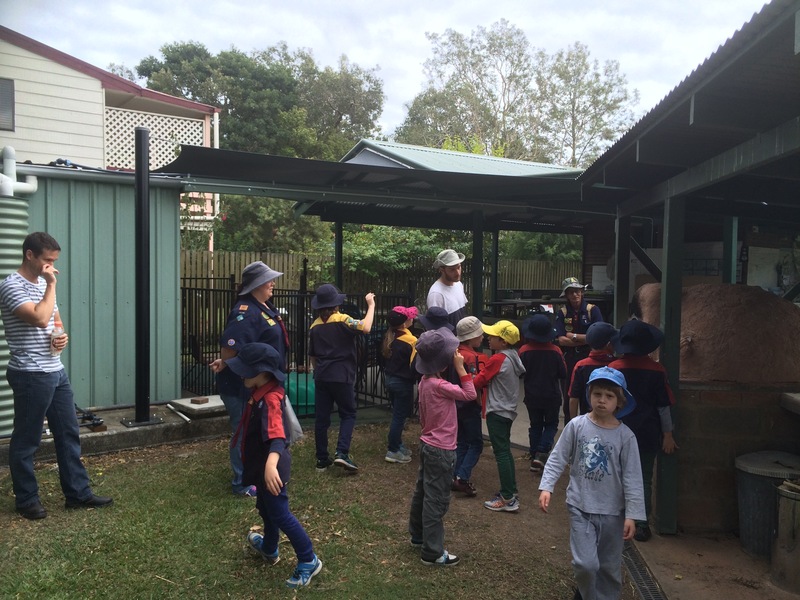 Torrential rain, wind and winter cold couldn’t prevent the Joeys coming together for the district Joey campfire at Upper Mt Gravatt den. 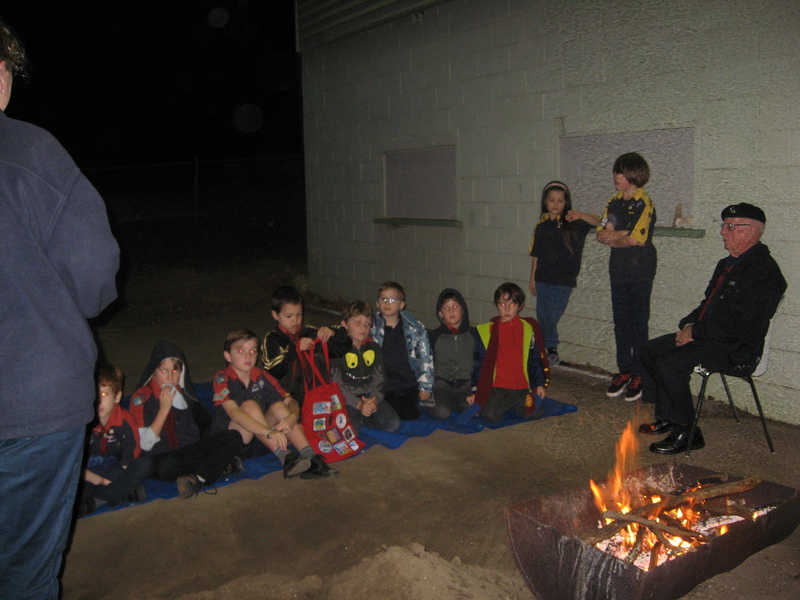 Rather than a traditional campfire outdoors, the district leaders took the whole production inside and the result? A terrific night of campfire traditions by lantern! 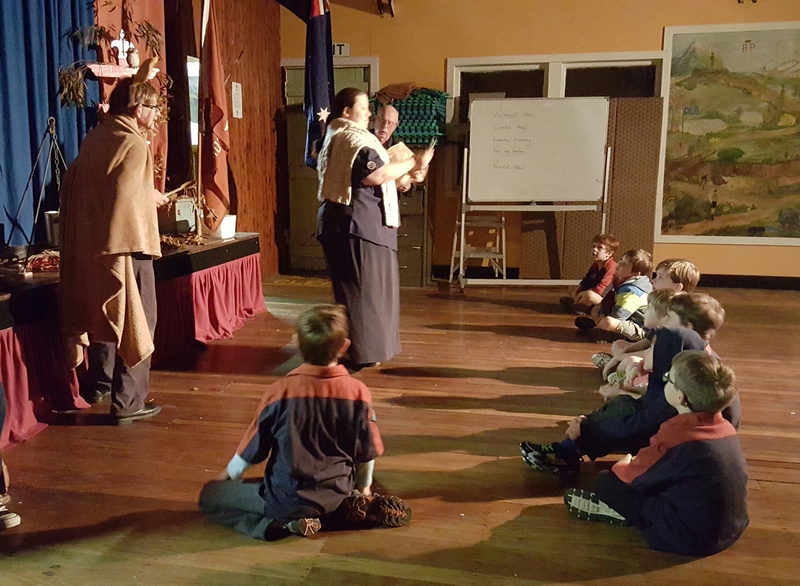 Emu and Raven led the joeys through campfire songs, Raven and Bagheera performed some skits ( ask the joeys about the Big Chief skit!) 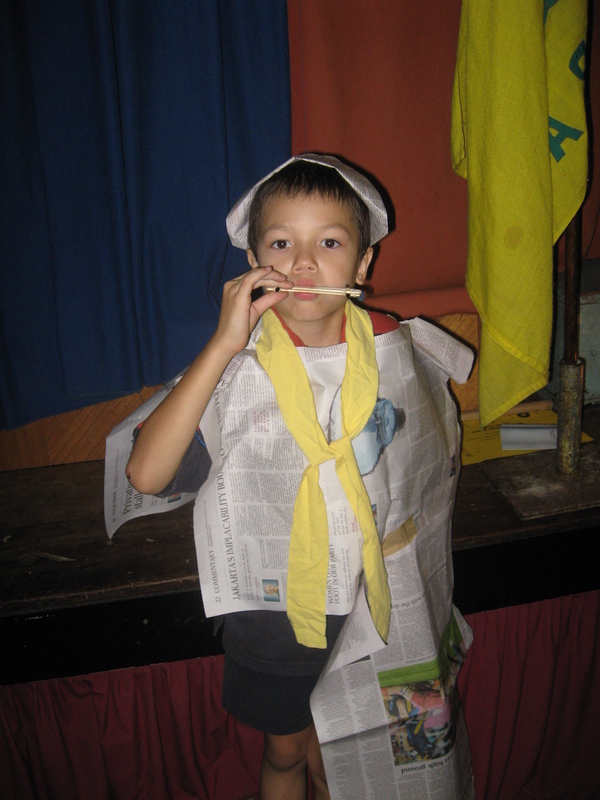 and Bagheera helped the cubs with a very exciting production of ‘the Bubble-gum’ skit. Energetic renditions of Three Chocolate Éclairs, Mamma Shark and Galumph meant that the joeys were all ready for the shared supper that followed. 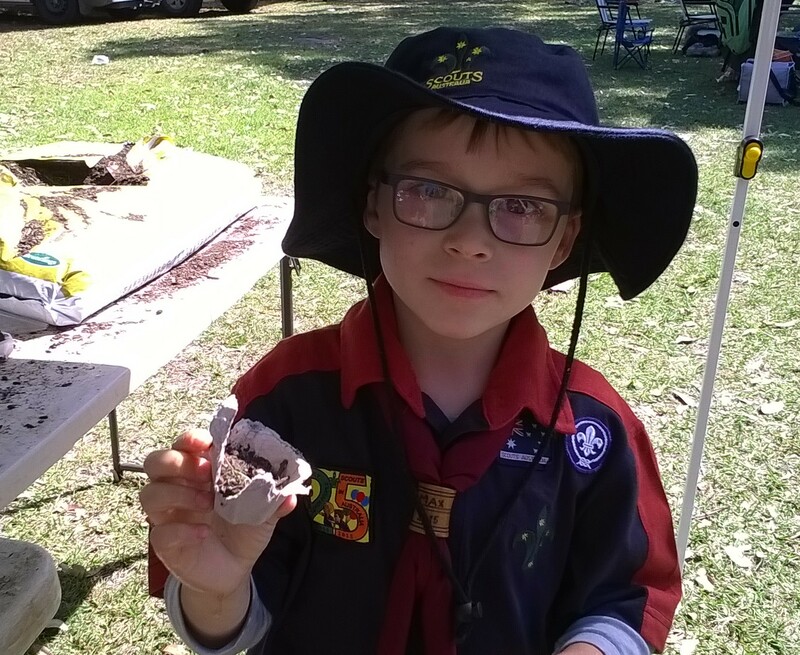 Each joey and cub that attended were also given a campfire badge for their collection. What a fantastic way to celebrate being a Joey on a cold wet night. 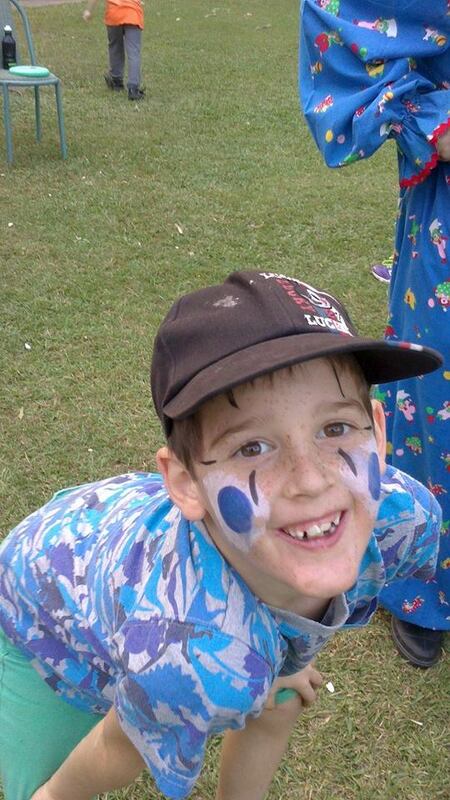 Buddy night walk with Clifton Hill mob. before heading off to meet the parents at the drop off point. 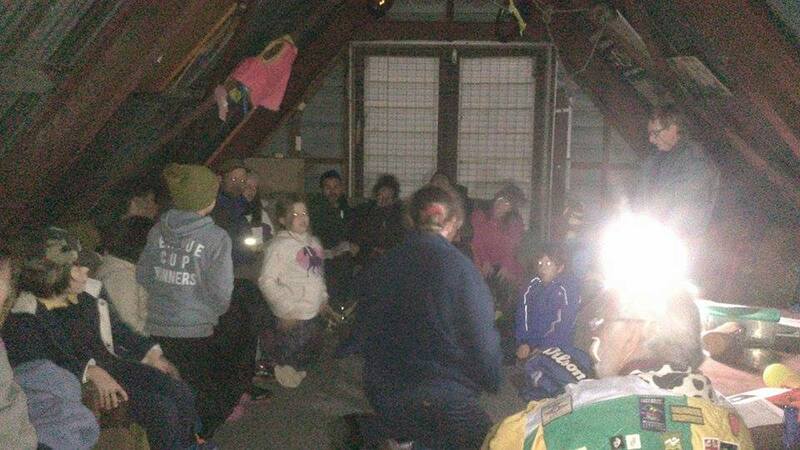 For some of the Joeys, this was their first night spotlight walk and they all enjoyed the experience. With 2015 being a special year for the Joey section – 25th Anniversary – all of the mobs in SEQ were looking forward to Joey Jaunt this year. 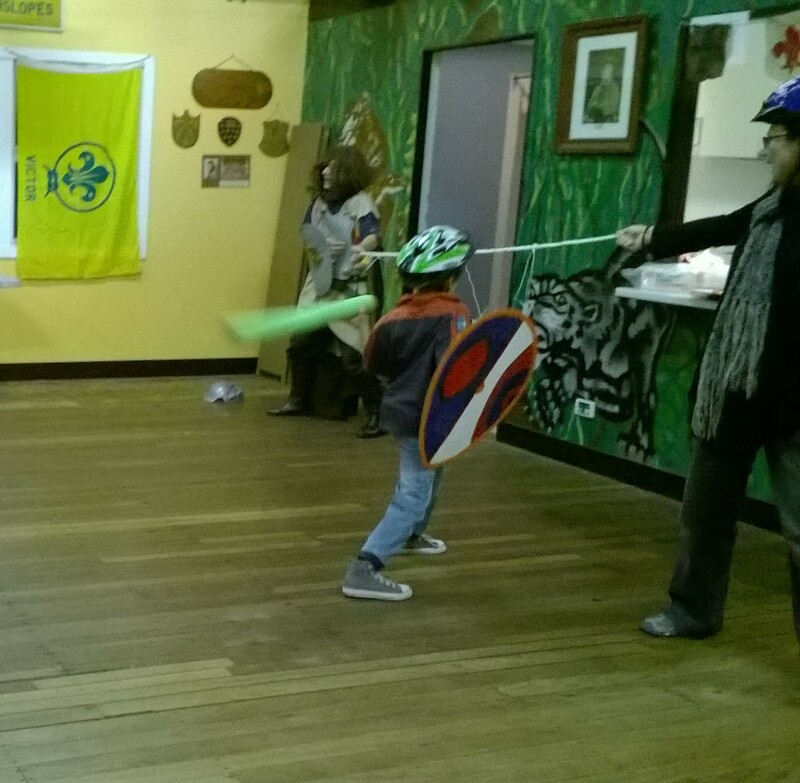 And when it was announced that the them would be ‘ Joeys Scouts of the Round Table’ , how could we resist having a medieval buddy night too? Clifton Hill mob visited us to move it ‘medieval’ style. Each joey made a medieval ID badge displaying their medieval Knight/Lady name and added a picture of themselves, before moving on to make their own shields ( they each had to design their own device design). Stealth skills were employed in ‘Hug a Tree’ and spotlight outside. 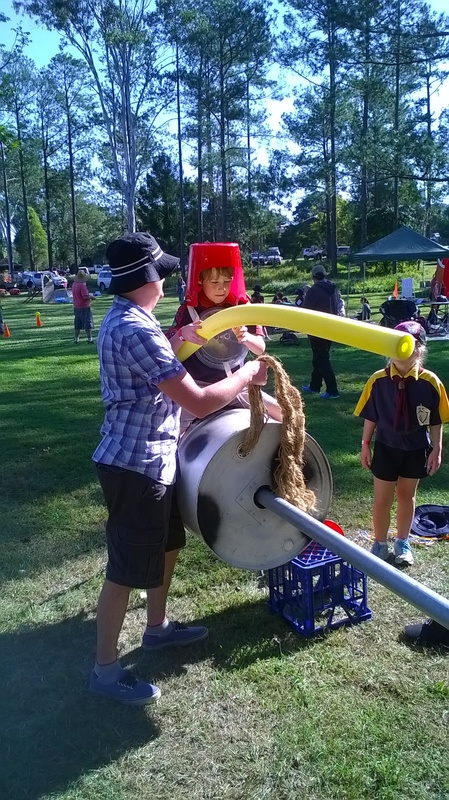 Then all of the joeys donned bike helmets to learn pool noodle jousting with shields. 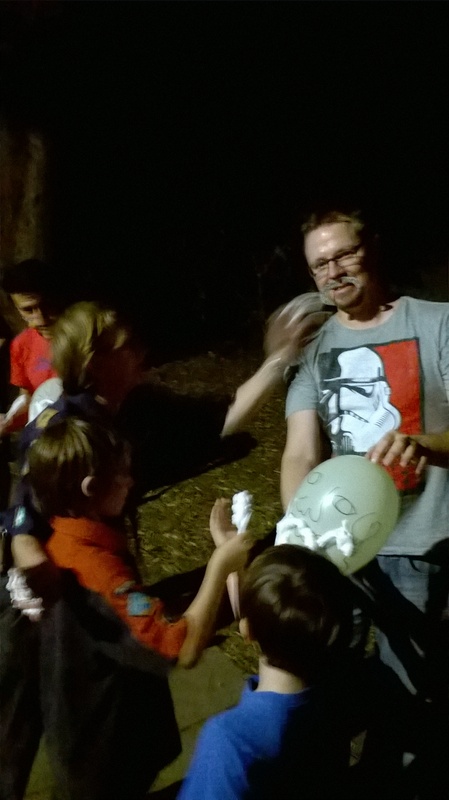 Huzzah to the fun had by all! Thank you to Raven for lending us the pool noodles and shields. As you can see from the programme below, the remainder of term 3 was filled with so many exciting events and happenings. They deserve their own posts so that you can see the photos of the many adventures shared by Victor mob. 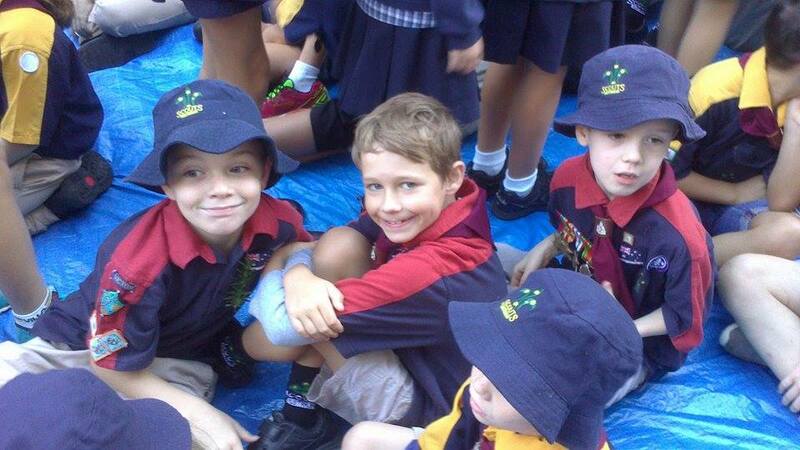 What a busy and exciting Term 2 the Joeys had! Term 2 shaped up to be even busier and more exciting that Term 1 for the mob. 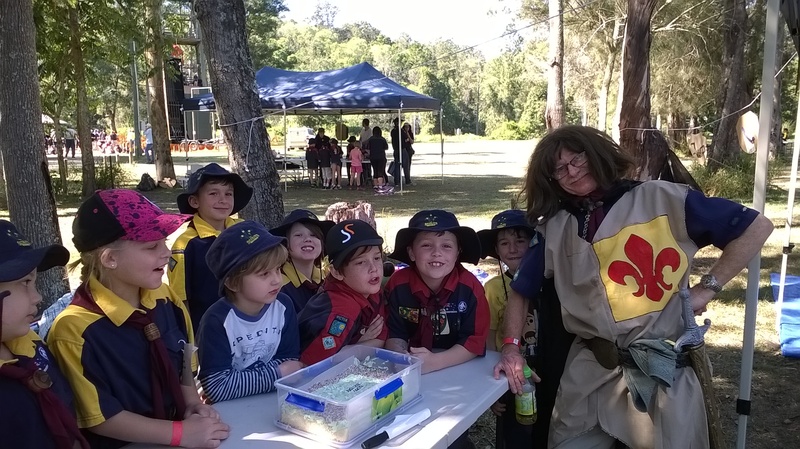 There were so many wonderful activities – camps, campfires, Anzac Day and Mother’s Day – that the Joeys were busy every meeting! 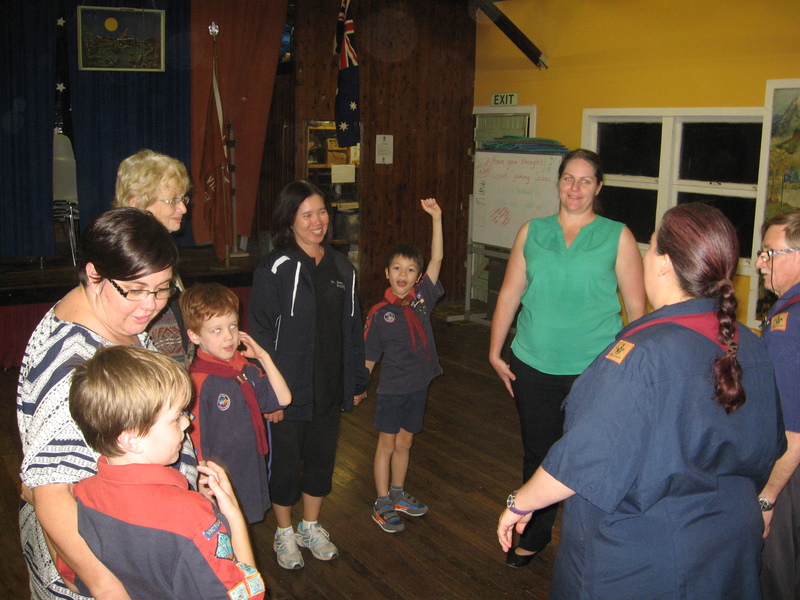 Two new members were invested AND two of the Joeys achieved their Promise and Link badges and advanced to the cub section! 7 World Environment Day celebrations. The 100th Year Celebration of Gallipoli and ANZAC Day. 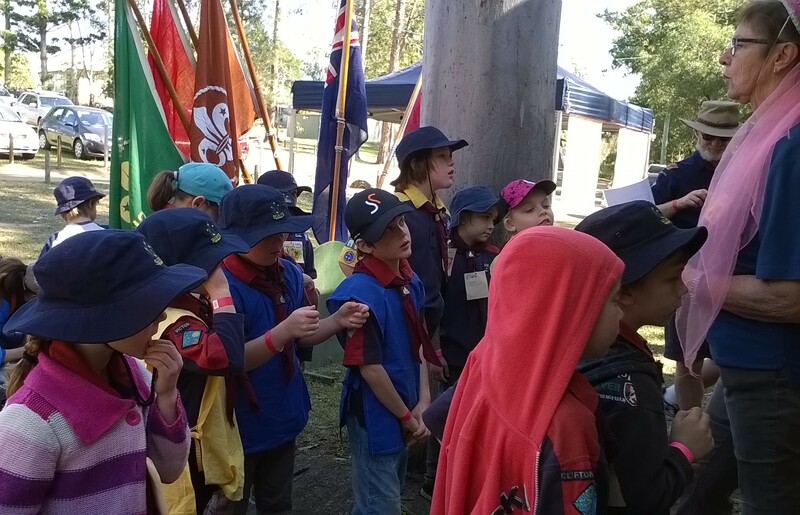 The Joeys spent several weeks learning about Anzac Day, it’s meaning and why we celebrate it before taking part in the Anzac Day March and Service at the Holland Park RSL Sub-branch. It was a moving service and the Joeys were respectful of the significance of the service and the ceremony of the day. Jason carried a photo of a family member who served in the First World War and Patrick helped to lay the wreath. Each Joey in the mob earned their ‘Their Service, Our Heritage’ Badge. 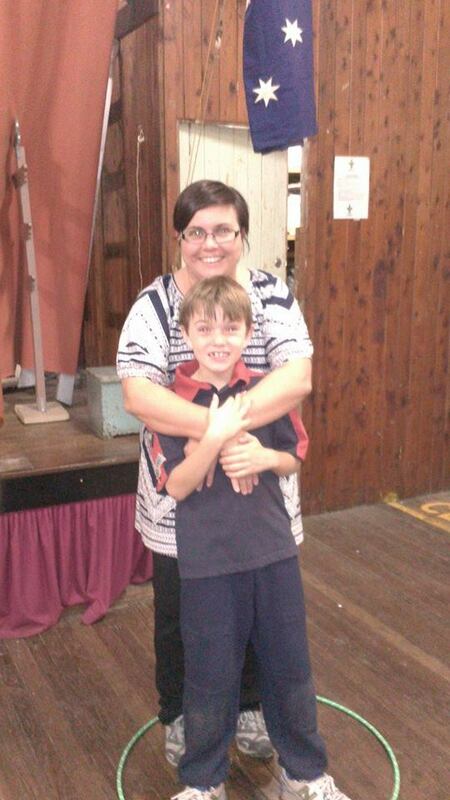 To celebrate Mother’s Day, the Joey invited their Mothers or carers along to share a special night with the mob. 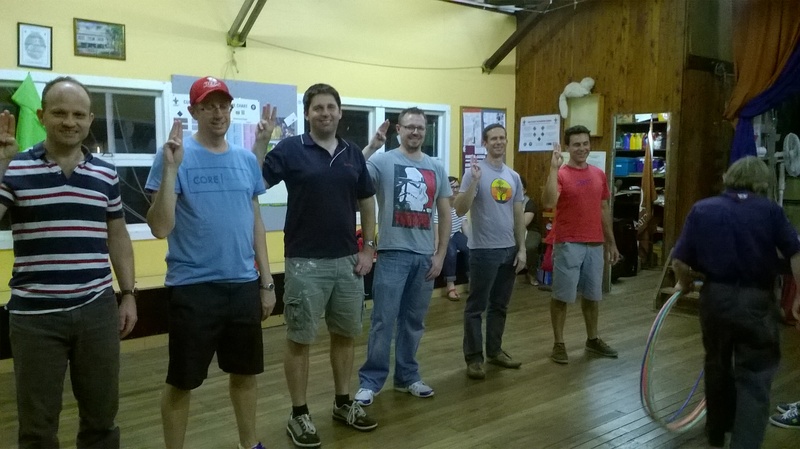 The Mothers had to undergo the official Joey training ( with a pop quiz) before being inducted into the mob as ‘Honourary Joeys’ for the evening. 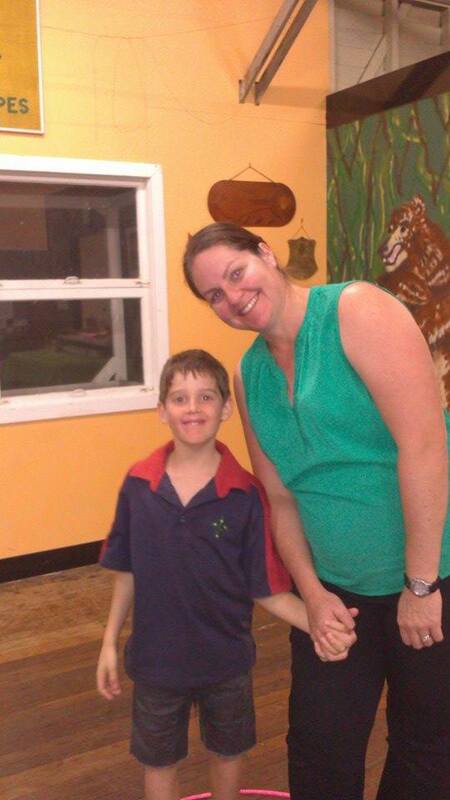 The parents took part in games like “Hanging out the Washing’, Shark island and Hug a tree before sharing supper. Thank you to all the parents who helped make it such a fantastic night. 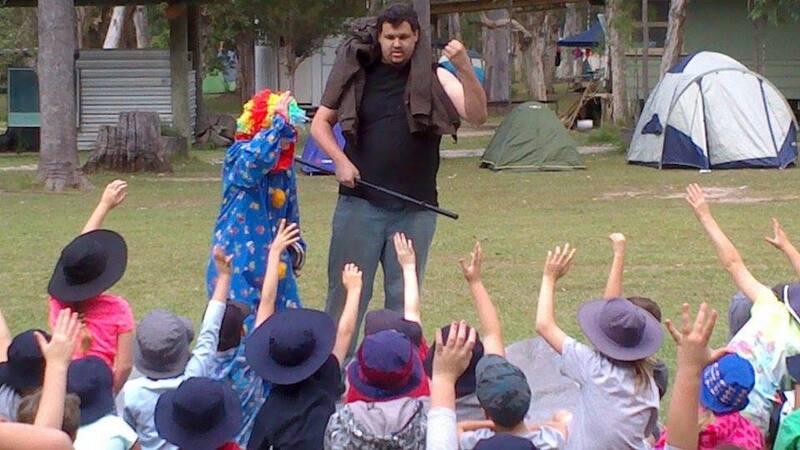 Roll Up, Roll Up to the District Camp! 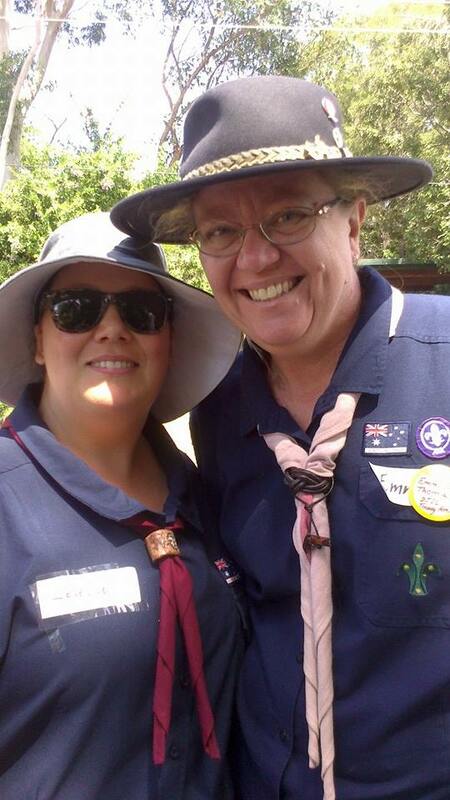 Over a slightly wet weekend in May, some of the mob attended the District camp. The theme this year was the Circus and what circus would be complete without clowns, strongmen or ringmasters (leaders). 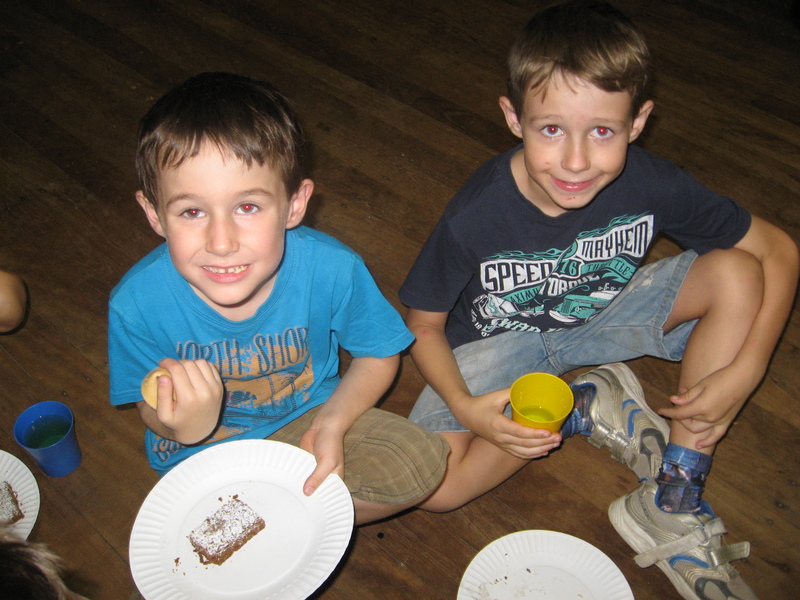 Lot’s of great activities, food and a campfire rounded out what was a fabulous camp. 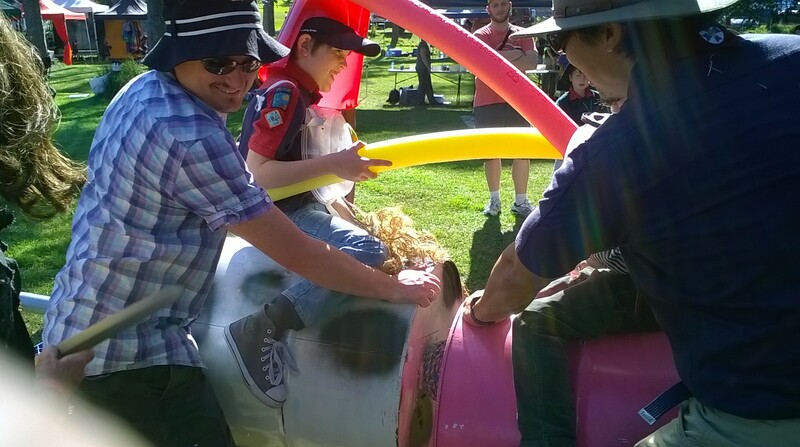 And let’s not forget the scouts creating some amazing swings, chariots etc. for the cubs and Joeys. And the jumping castle! Monster Munchies no bake night. For hungry Joeys, this was a night of tasty treats that involved no baking. 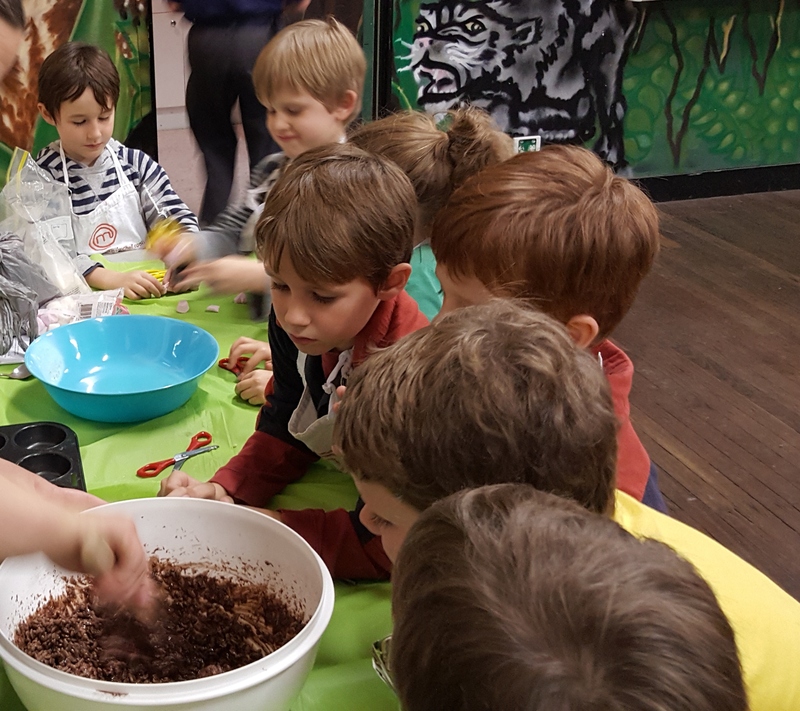 The Joeys helped make coconut ice, chocolate crackles and Wizz Fizz before taking home packed containers and recipes to share with their families. Need we say more? Wombat Stew – Ooey, Gooey! What better way to finish off our cooking adventure than to combine a beloved Australian children’s book with making stew. A rousing version of Wombat Stew was told by Rikki and acted out by Bagheera and Wolf to the joeys amusement. 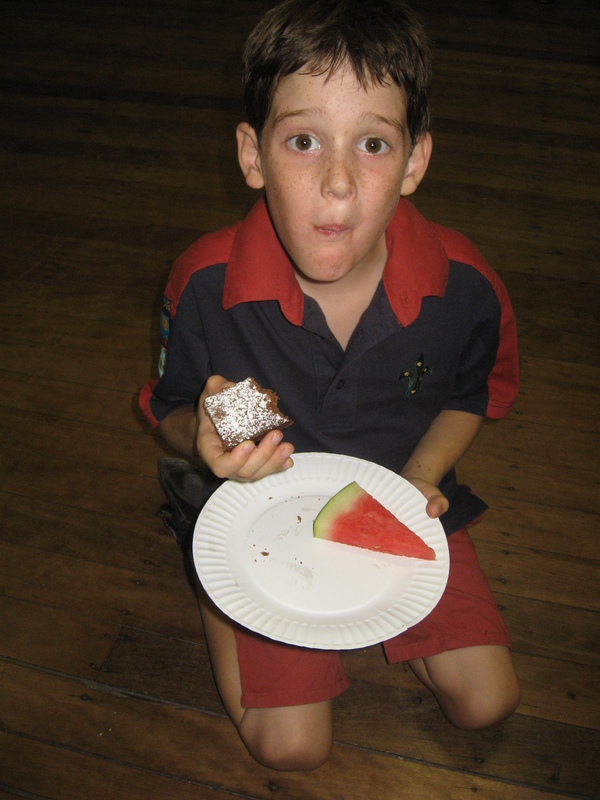 Little did they know that all of the pot ingredients – flies, mud, gum leaves etc. – would be their supper. 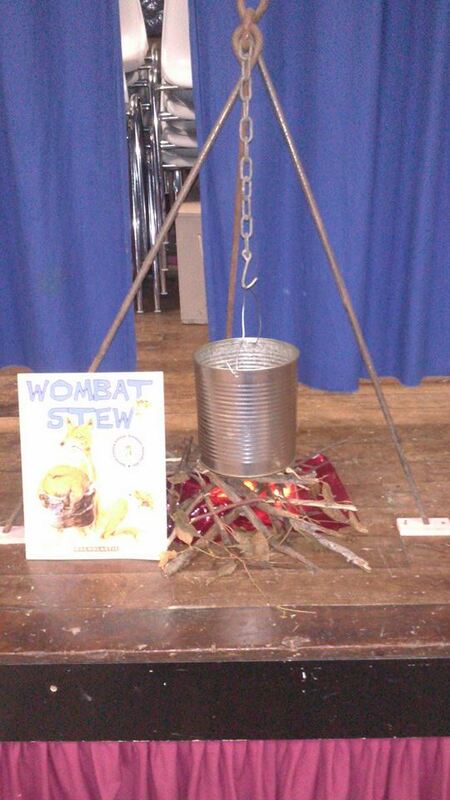 Only kidding, the joeys actually had home made vegetable soup as their Wombat Stew to round off the nights fun. 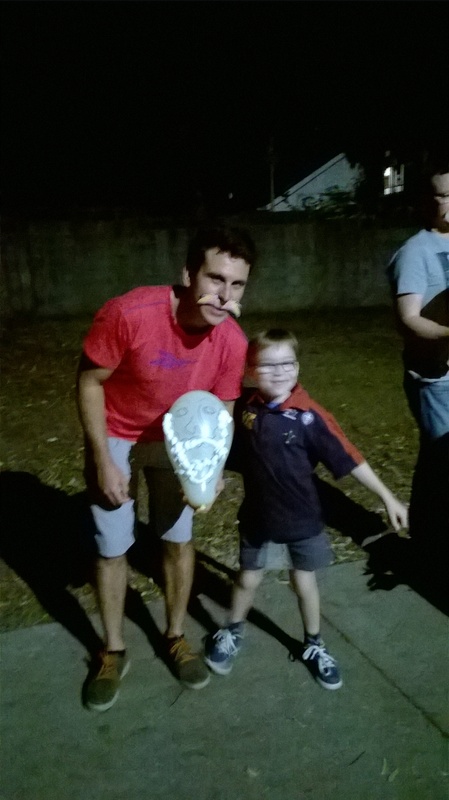 With the final night of term upon us, it was time to celebrate two very special achievements. 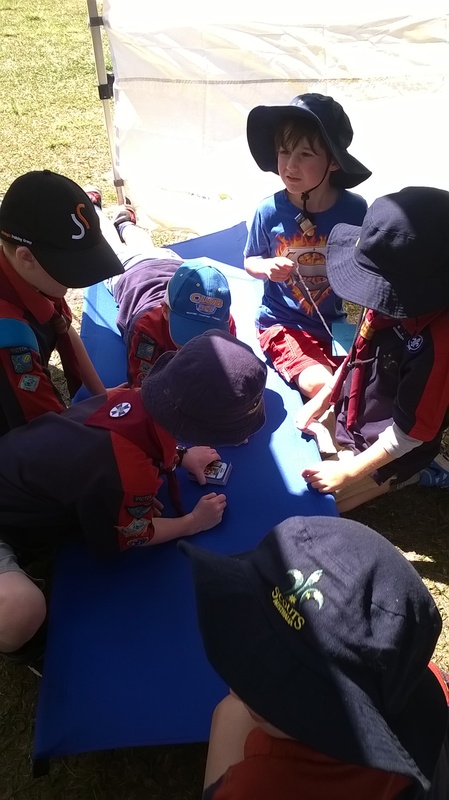 Patrick and Jason had both undertaken the task of completing their Promise Challenge badges and their link work in preparation of moving up into the cub pack at the start of term 4. They had both worked very hard on their individual projects and deeds. 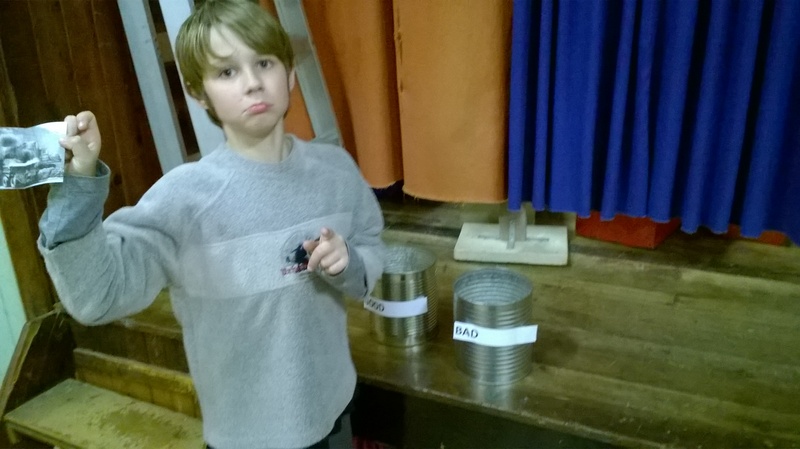 Wolf and I were very proud of their hard work. As a fitting, and final, send off from the mob we held a special campfire with pizza and cake for supper to celebrate with them. 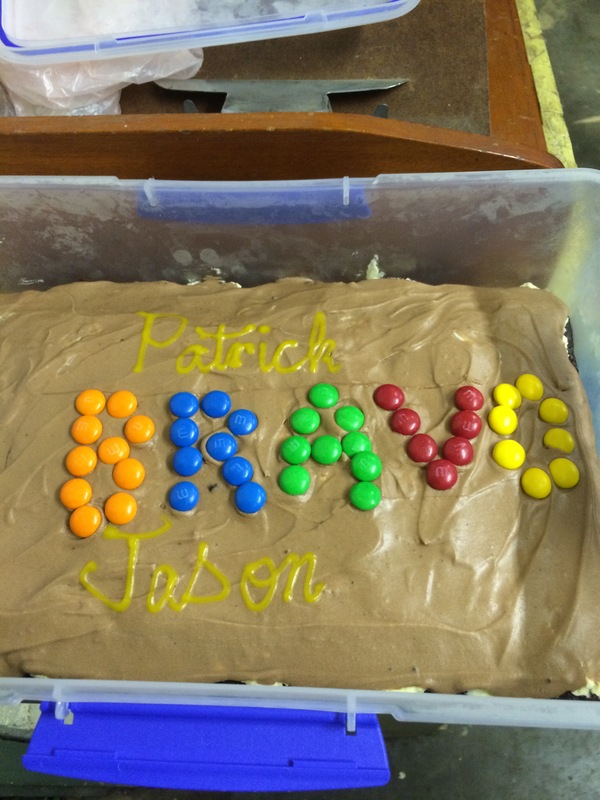 BRAVO Patrick and Jason! 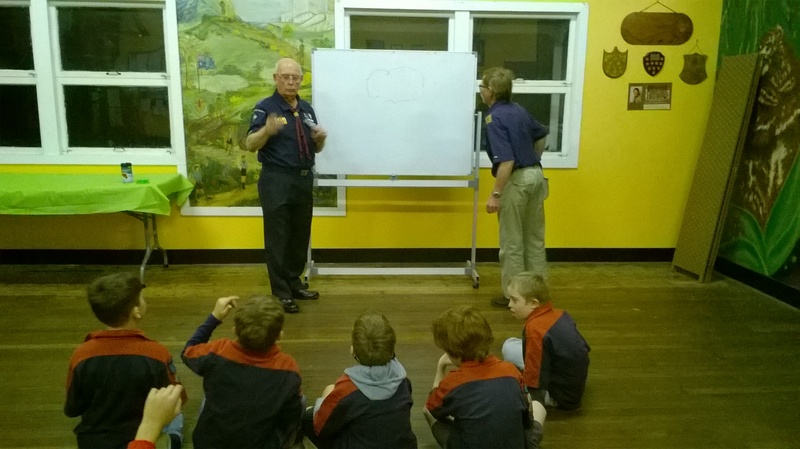 Victor Joeys celebrate the new scouting year – Term 1. It was with much excitement that the mob came back after the long summer holidays. 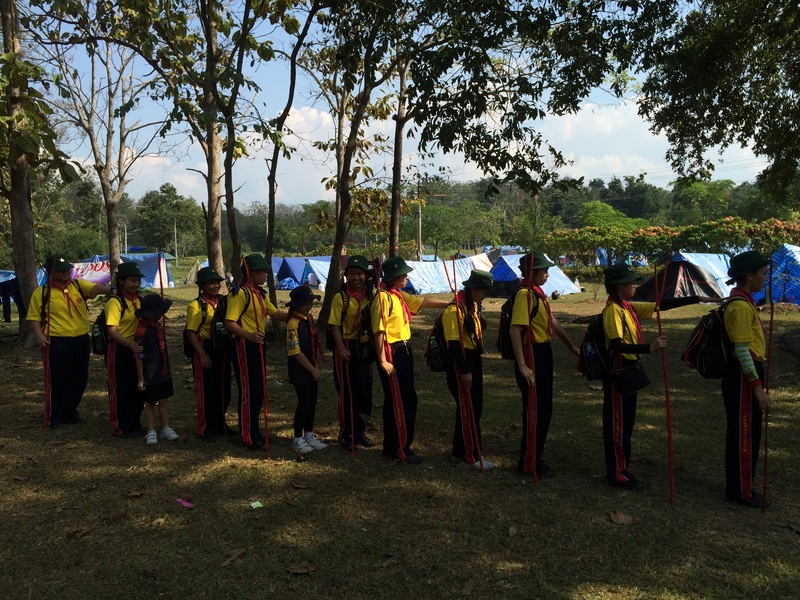 They were all looking forward to another exciting scouting year of adventure, challenges, fun and friendship. And that is just what they got during Term1. 4 HOP! Joeys care and share. 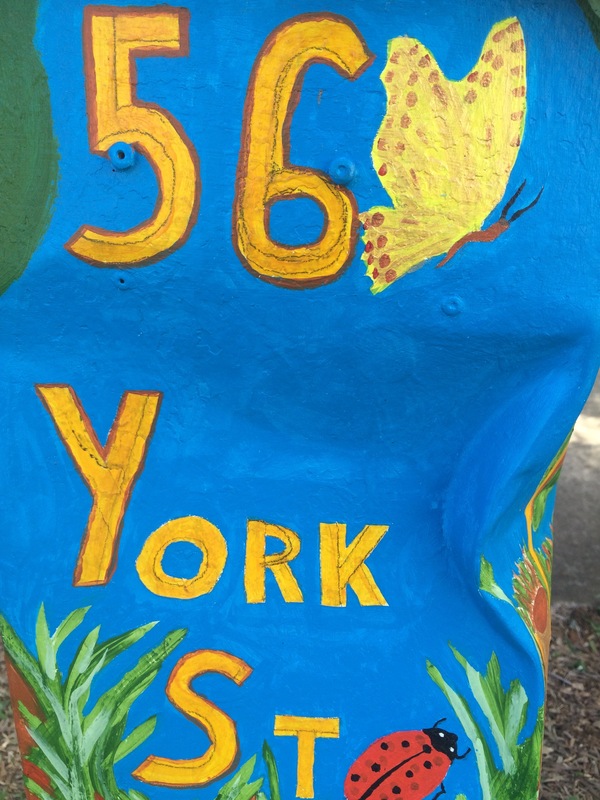 6 Environment – recycling and me. 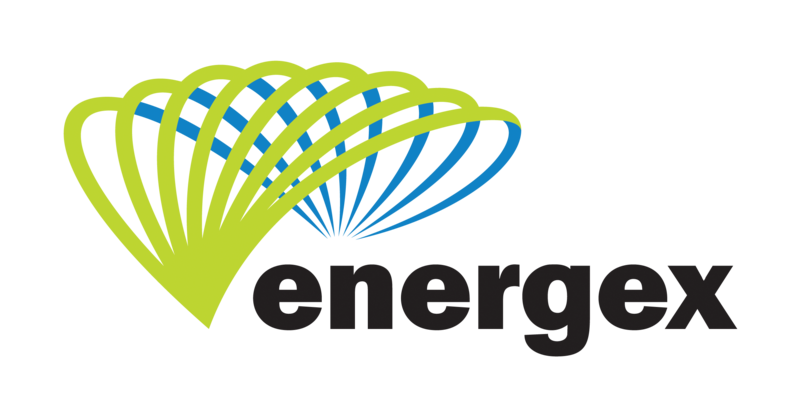 8 Earth Hour – Lights out night! 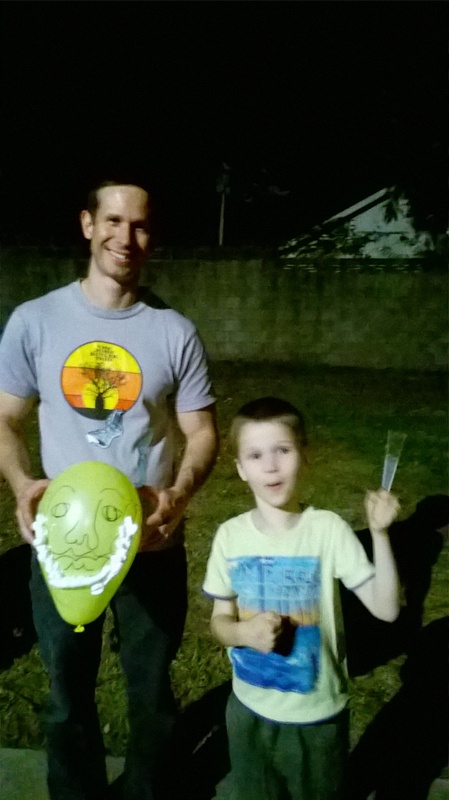 9 Easter Celebrations and end of term night. 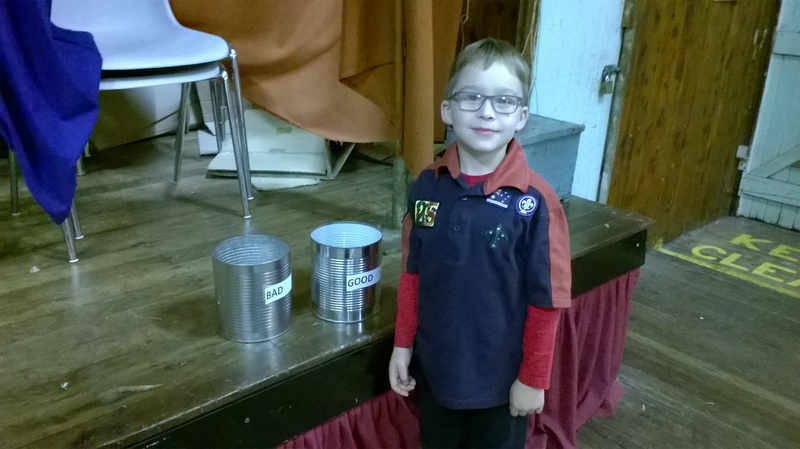 Advancement from Joey to Cub section. One of the most exciting things that happen for the Joeys is when they move up from the Joey mob and are invested into the Cub section. And Seraphina achieved this just before Founders Day! 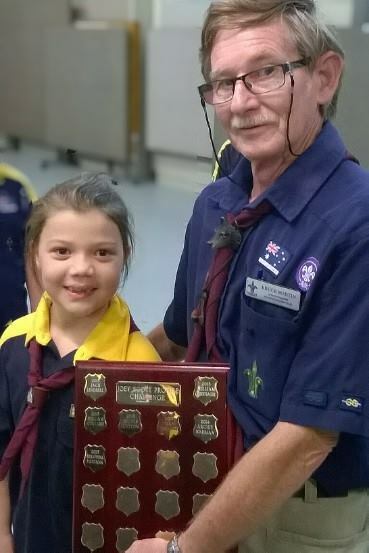 She completed her Promise Challenge work, undertook her link badge and celebrated her next big adventure in scouting with her friends in the mob. 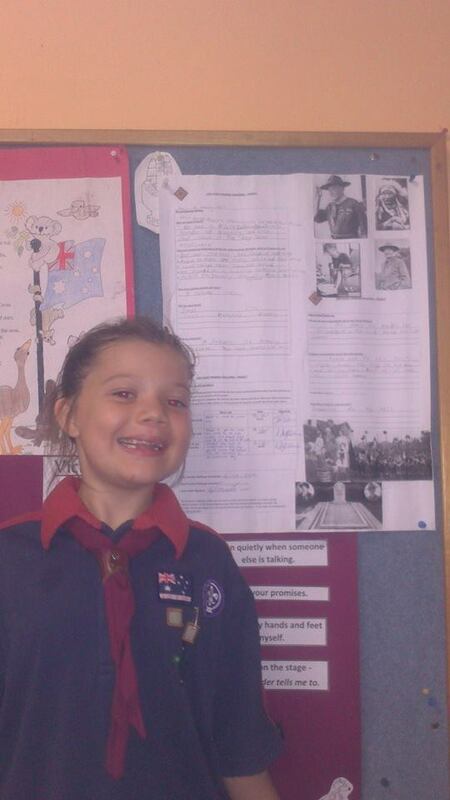 BRAVO Seraphina on all your hard work and good luck in the pack. HOP, BP and Founders Day. 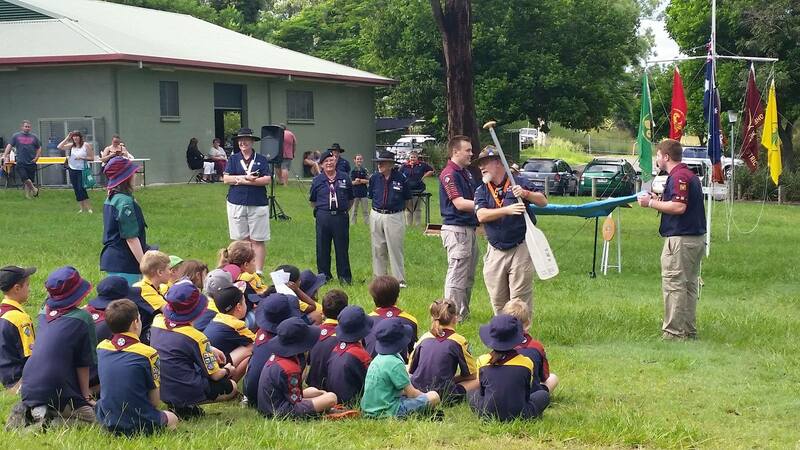 With the date postponed due to cyclones, the district celebrated Founders Day (BP’s birthday) with our annual service followed by the JACS (Joey and Cub Scouts) section rally. 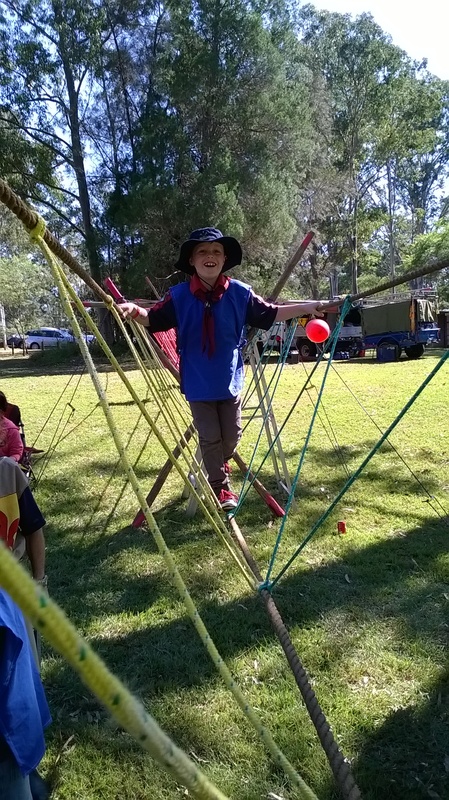 There were all kinds of wonderful bases being run by our dedicated sections leaders – marshmallow cannons, rope bridges and climbing. 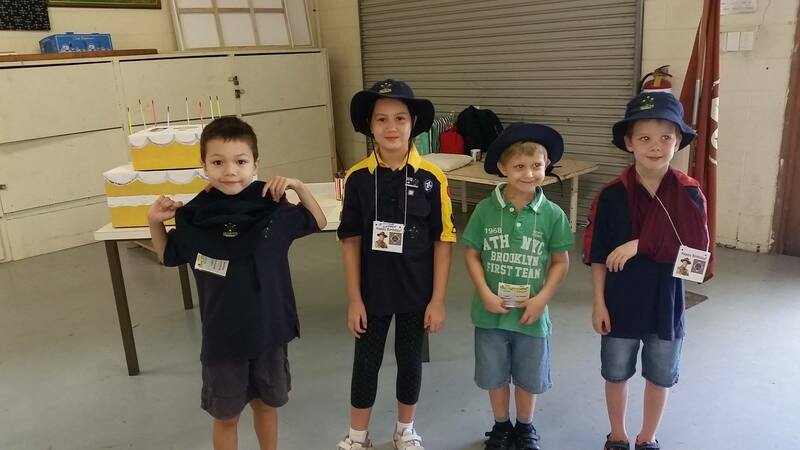 Victor Joeys ran the birthday code breaker base and challenged the cubs and Joeys to crack the code and learn some interesting facts about BP! And the icing on the cake? A special collector badge of course! 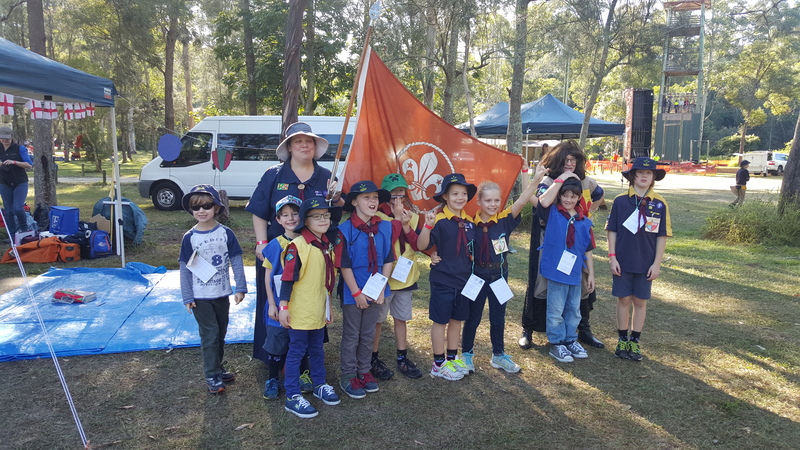 Harmony Day Pack attack with the Cubs! 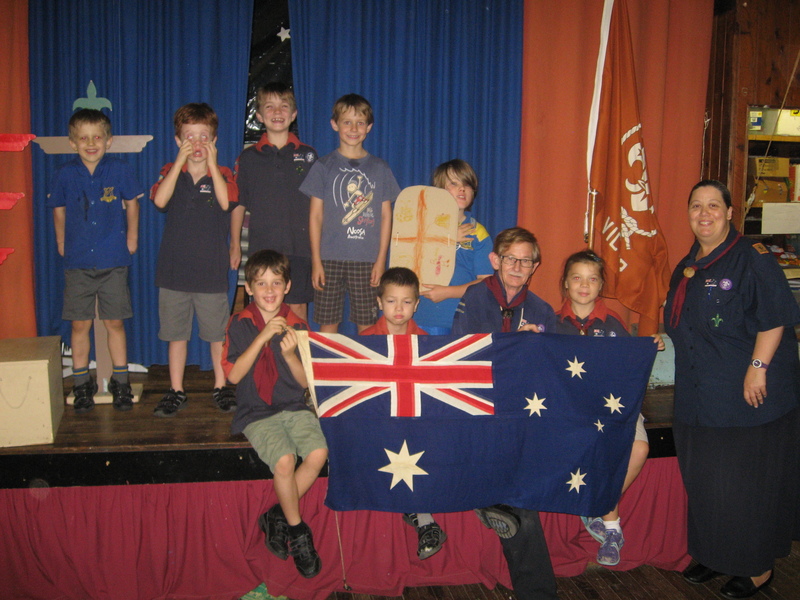 To celebrate international Harmony Day, the joeys and cubs joined forces to share a night exploring this years theme – “Everyone Belongs”. 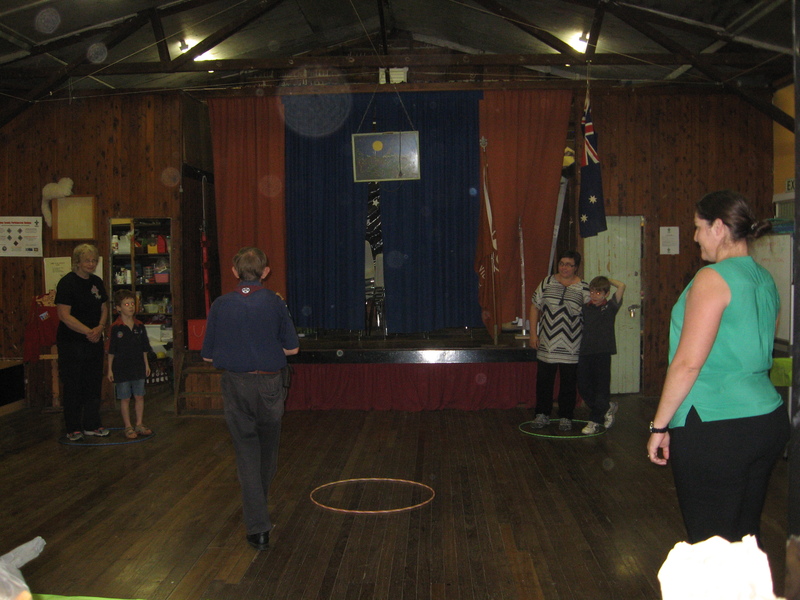 The youth members took part in games, activities and fun before they shared supper. Congratulations to all those who came along and earned their special event badges. 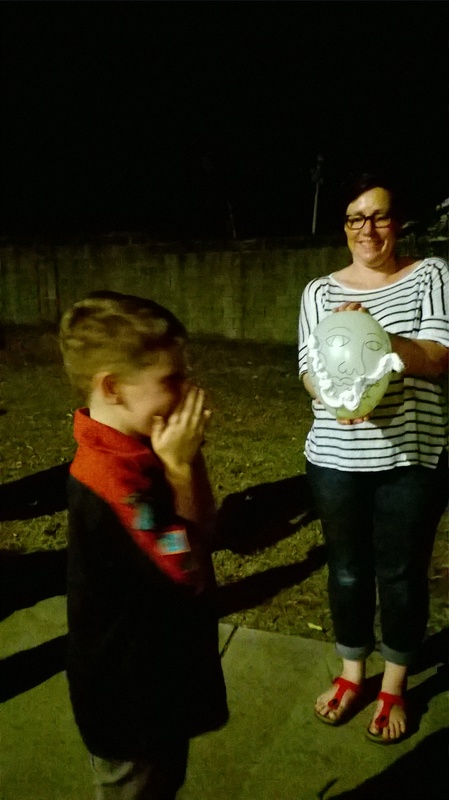 As part of their Environment Challenge, the Joeys celebrated Earth Hour in true Joey style! 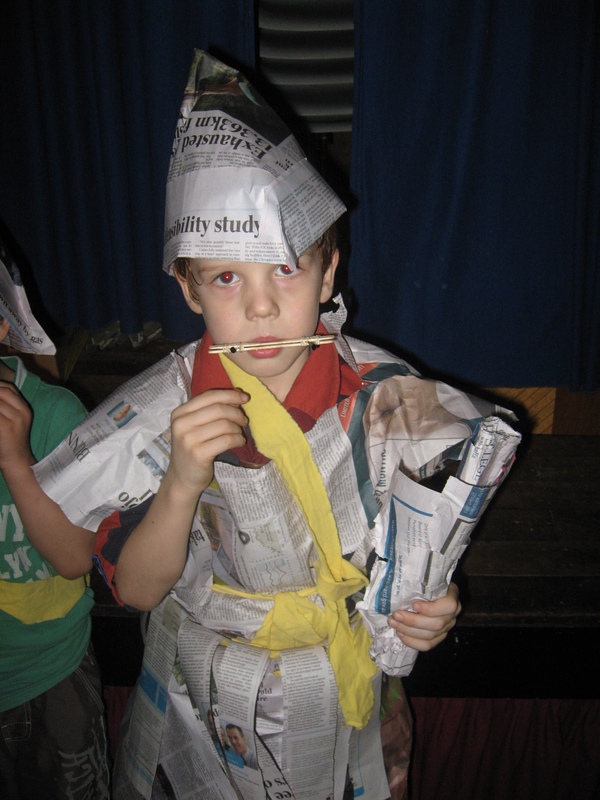 The hall was set up like a huge tent with lanterns, cushions and a ‘campfire’ and the joeys took part in the recycling theme of the night by creating their own ‘up-cycled’ outfits from newspaper before constructing paddle pop stick harmonicas. And of course, what campfire would be complete without a few songs? ‘Three Chocolate éclairs’ and ‘My Aunt came back’ were the joeys choice. 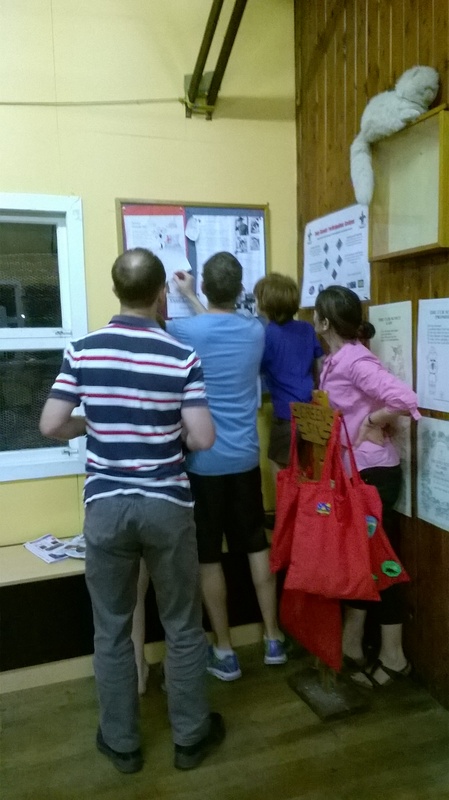 Oh, and Bagheera took part in a Branch training day exploring Australia’s First Nation Peoples. 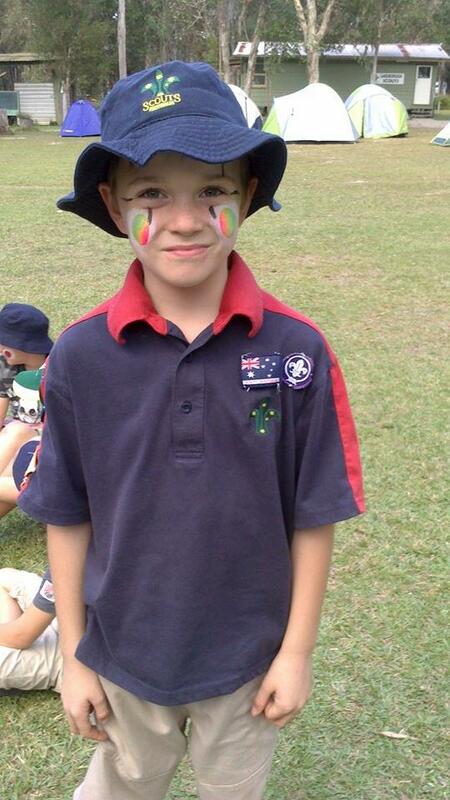 The leaders learnt about bush craft, boomerang throwing and cultural knowledge. It was a fantastic day of knowledge sharing and a wonderful opportunity. 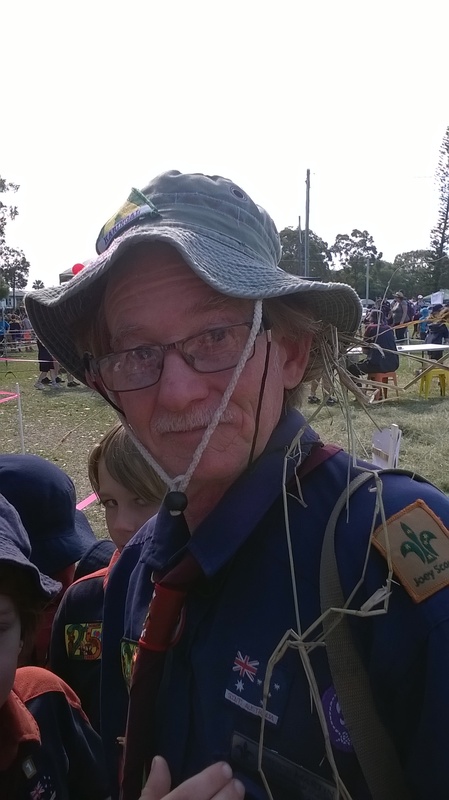 Thank you to the Branch Joey Scout Commissioner for organising it. 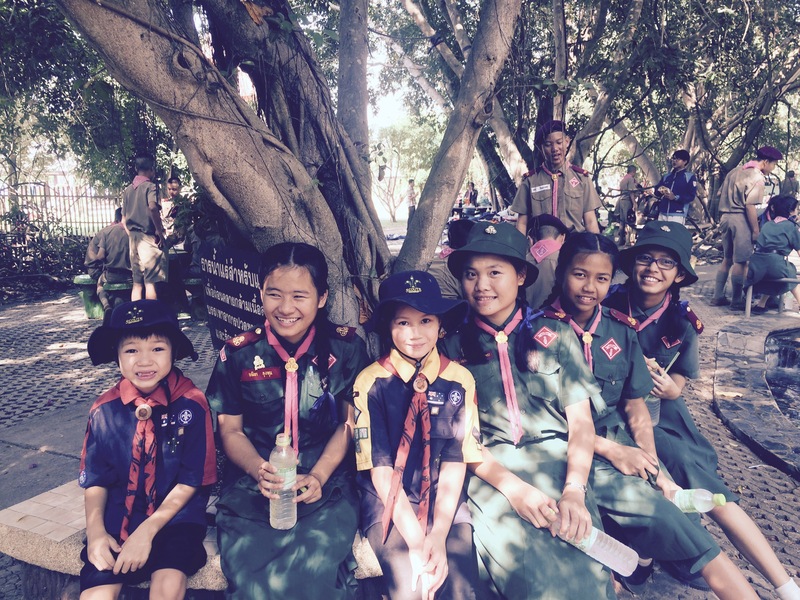 Adventures in Thailand for two very lucky scouts! 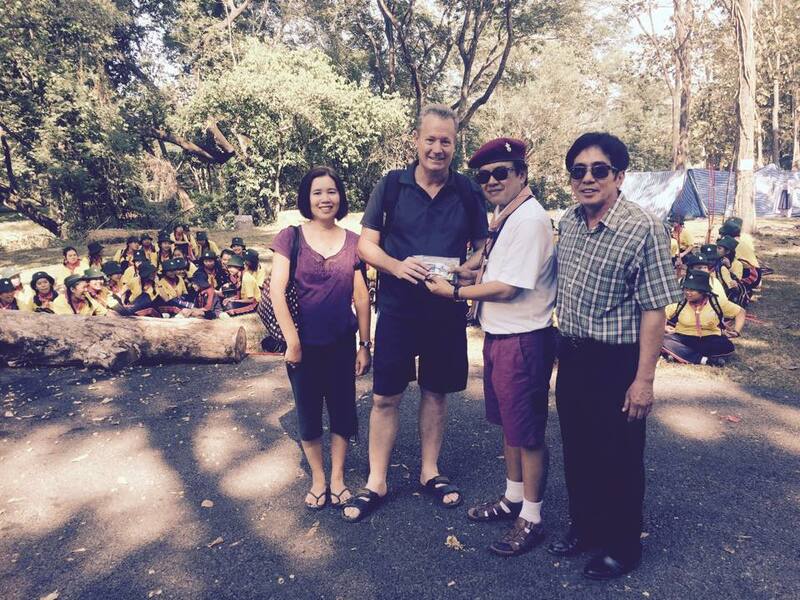 Over the Christmas holidays, two very lucky youth members at Victor visited Thailand with their family. 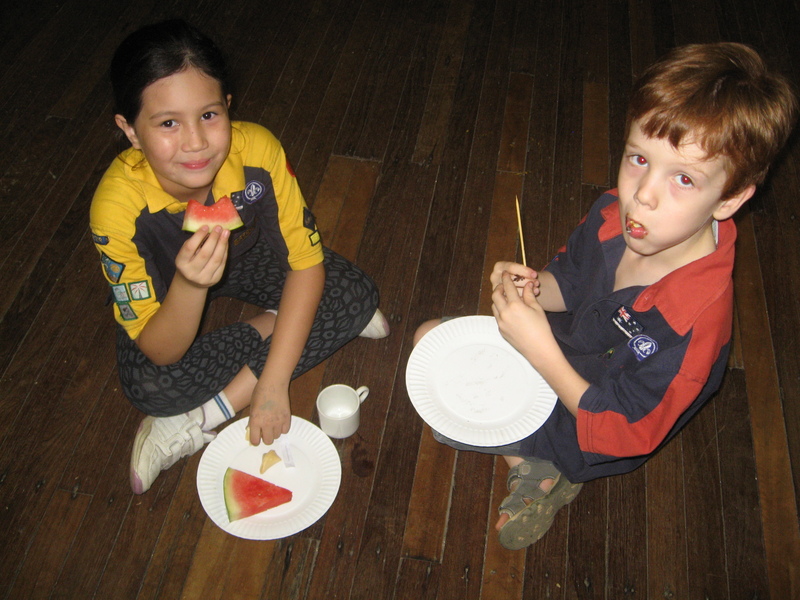 Jason and Nicole, like all scouts, were prepared for their trip with Australian scarves, uniforms and badges to exchange with scouts in Thailand. 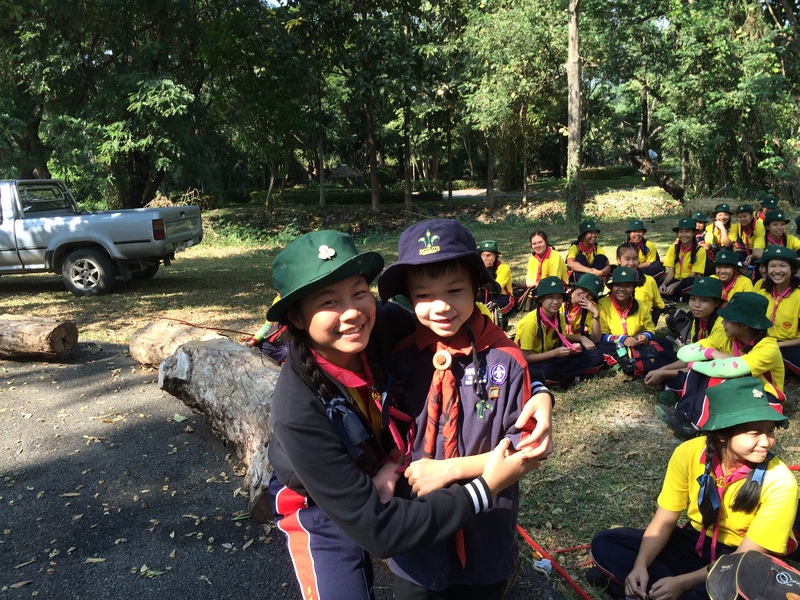 They spent several days with some Thai scouts – Sankampang School Boy and Girl Scouts – and shared how Joeys and cubs work in Australia, learnt about Scouting in Thailand. They were even lucky enough to take part in some adventurous activities. 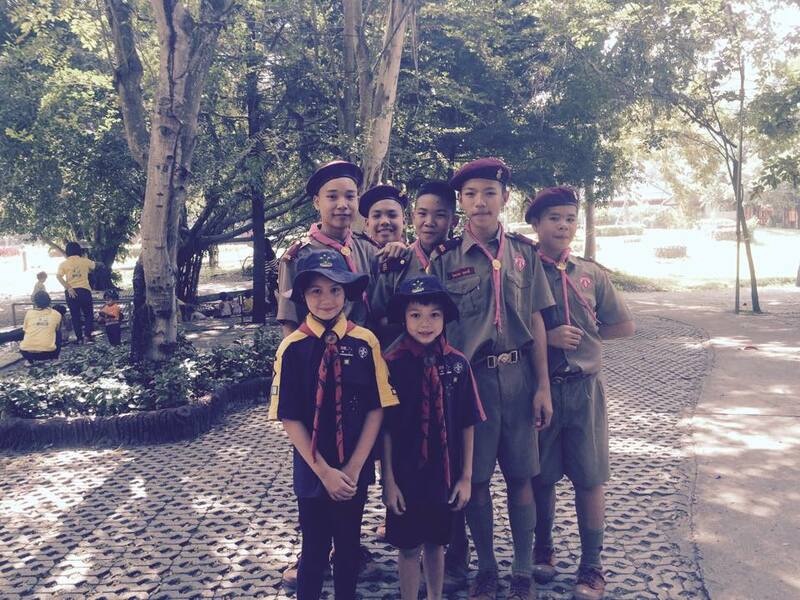 They also swapped some Australian badges for some Thai badges to add their own collection. 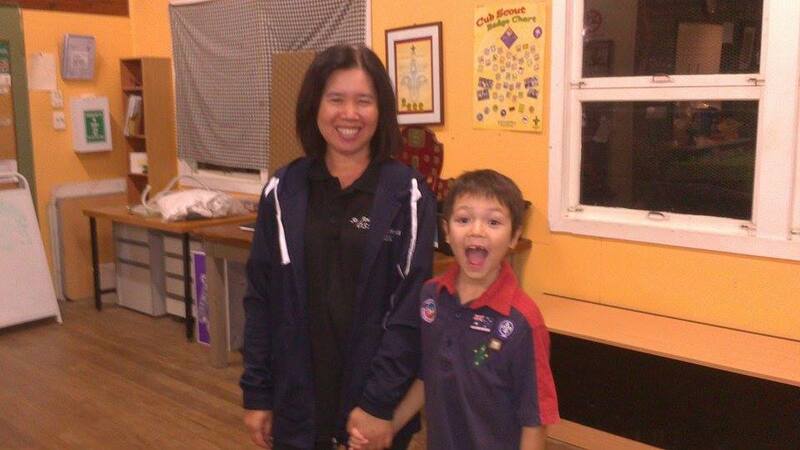 And 2 very lucky Joey leaders were also given a marvellous present by Nicole and Jason – some Thai badges and a woggle! 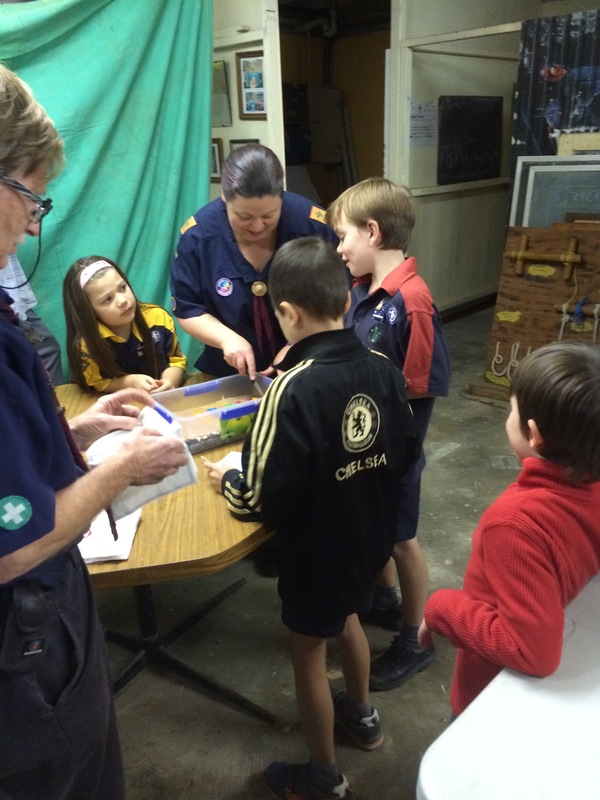 Thank you Nicole, Jason, Darunee and Garth for allowing us the chance to hear about how other scouts work, see some wonderful photos and have the opportunity to see some very special badges. 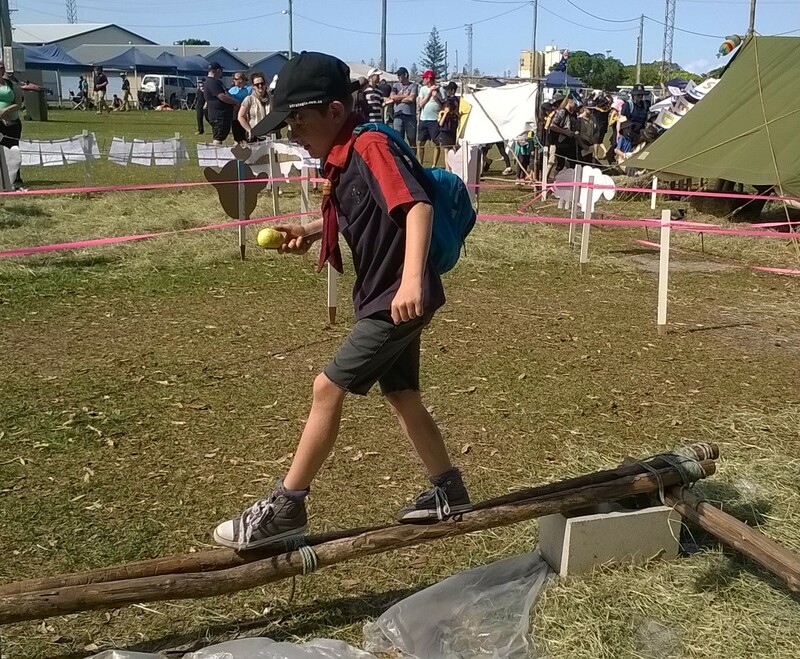 What do you get when you ask every scout group within cooee of the Redcliffe showgrounds to come up with the best activity a square lashing and a few staves can make? 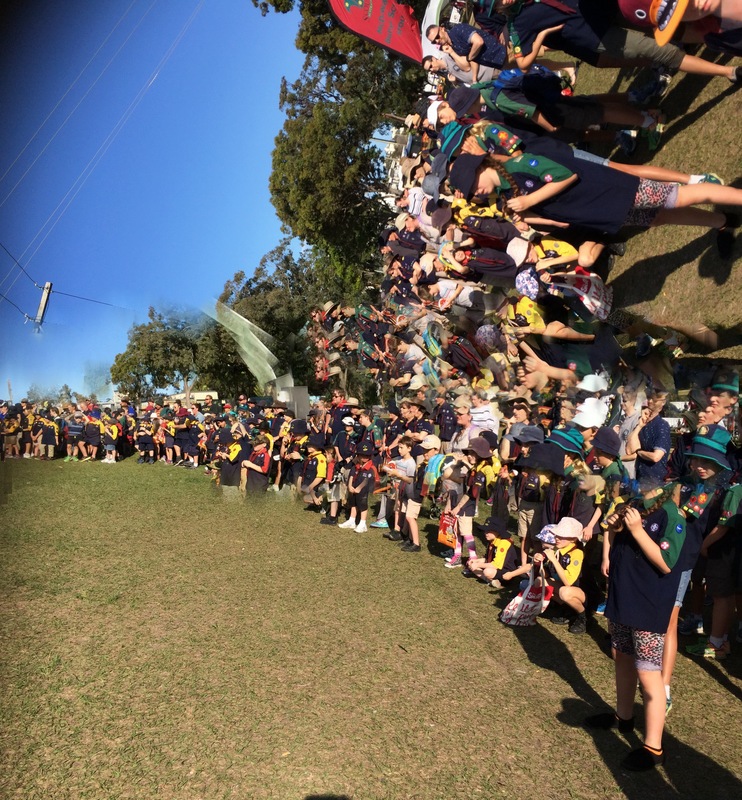 Skillorama or the best day out for Joey and cub scouts this side of a world jamboree. We checked out the merry go round, bucking bronco barrel, obligatory pillow fights on a pole and water rockets too ….. By days end there was Wolfs wistful “thanks goodness that’s over for this year” and “I got at new badge for my collection” …..hope you got him home ok Bagheera!